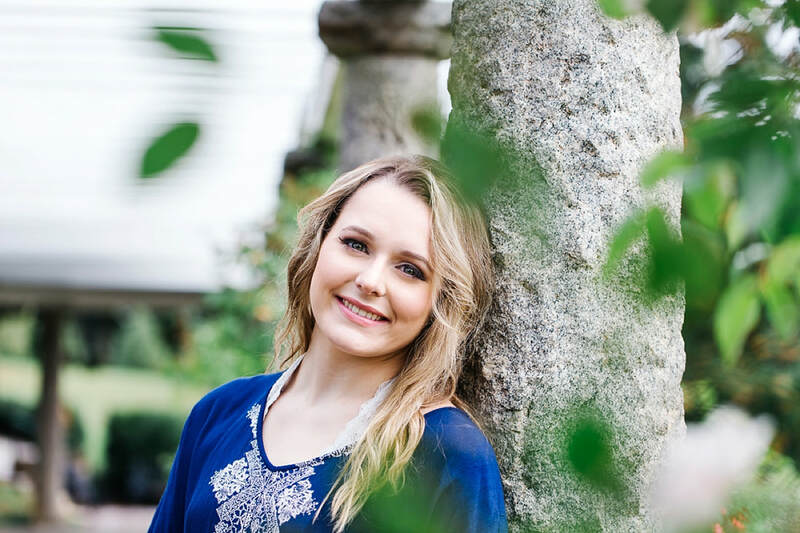 Bella is a senior at Hanover High School in Mechanicsville, VA and she chose to have her senior portrait session at the Carillon and Dogwood Dell area. I absolutely loved this spot and we had fun exploring so many little nooks within this location. 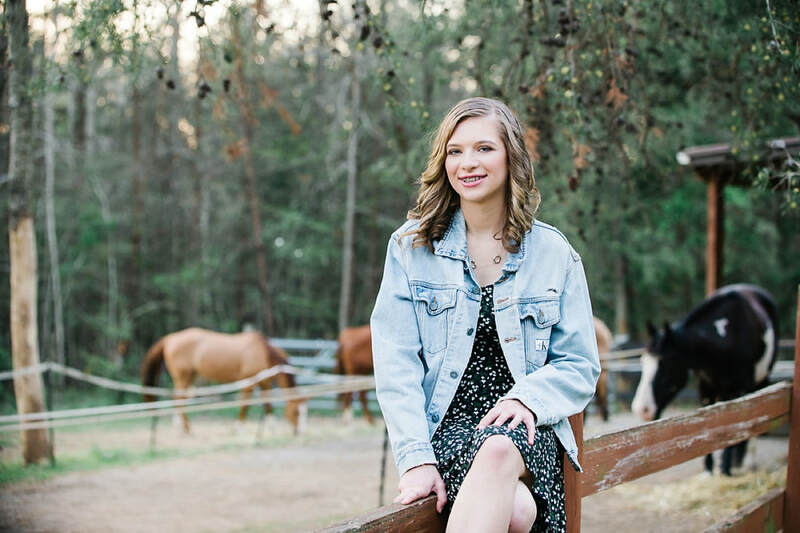 I'm so grateful for the opportunity to photograph Bella as she begins her final year of high school. 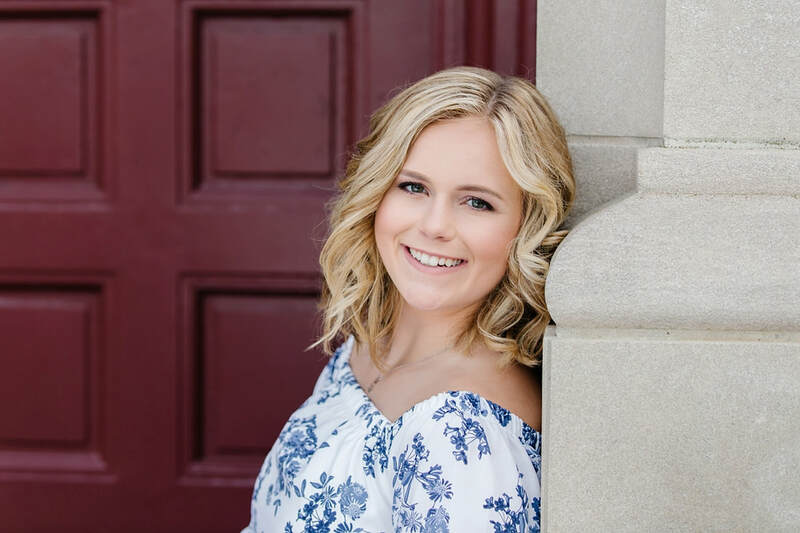 She is a beautiful person with a heart full of love for others - as she has shown through her service to others, including her part in our Hearts to Help Senior Model Project! She chose to support the Children's Hospital Foundation - an organization she has helped before by raising funds through cookie sales! 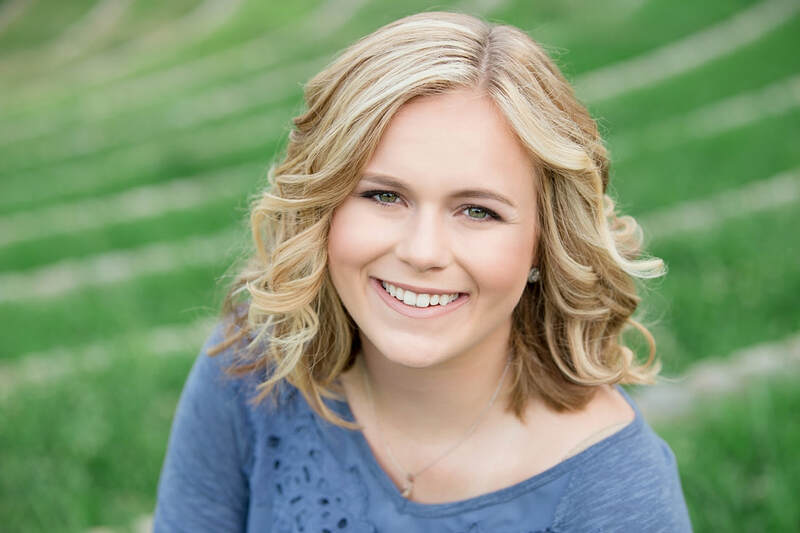 She is not only committed to helping others, but she is committed to her academic studies as well. 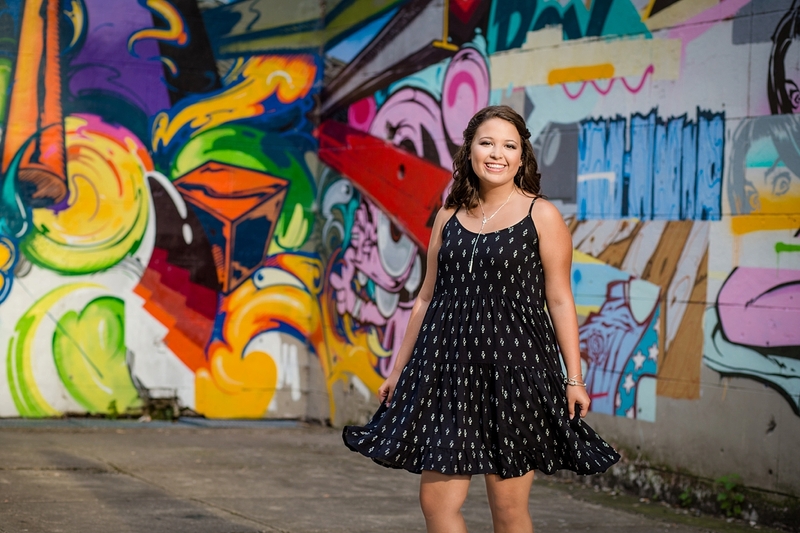 Oh Richmond, you are such a diverse city and a photographer's dream for outdoor senior portrait sessions! 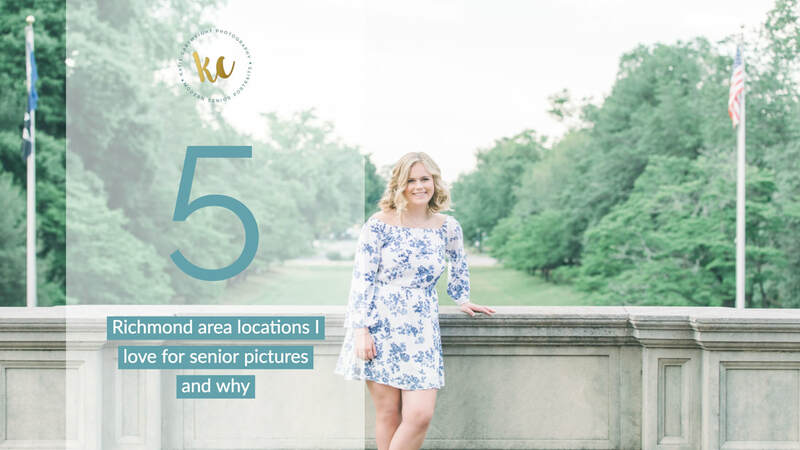 I'm breaking down my top 5 session locations today to give rising seniors some inspiration for their upcoming sessions! 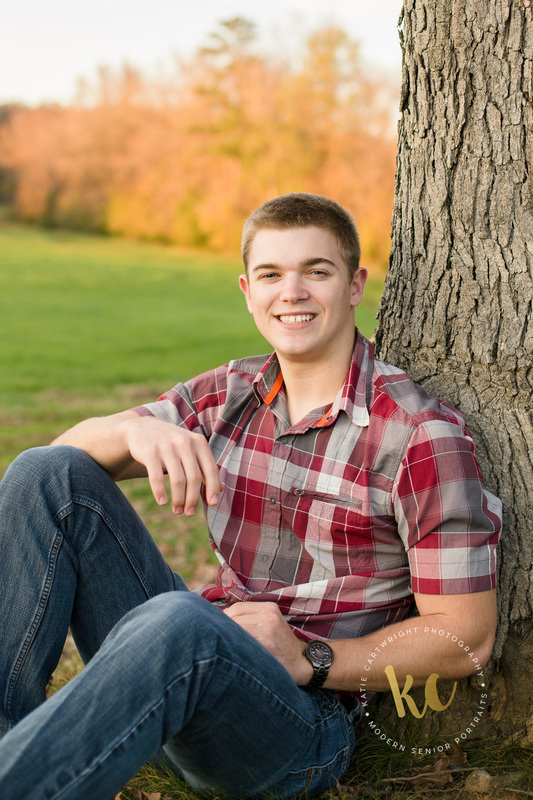 If you're not already booked for a summer senior portrait session, now is the time to start calling or emailing! 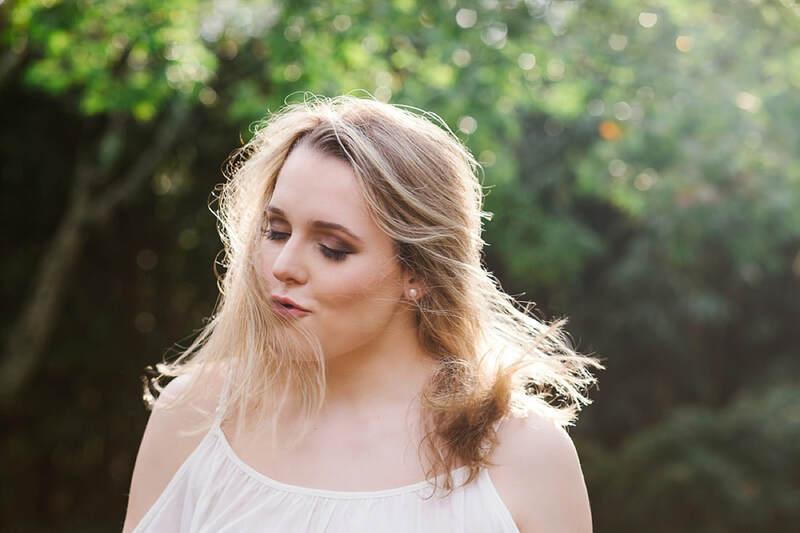 Booking is easy through my online booking website or if you'd like to meet in person and discuss the experience and ask any questions, you can book a complimentary consultation before you book! Want a location with contemporary style and pops of color? 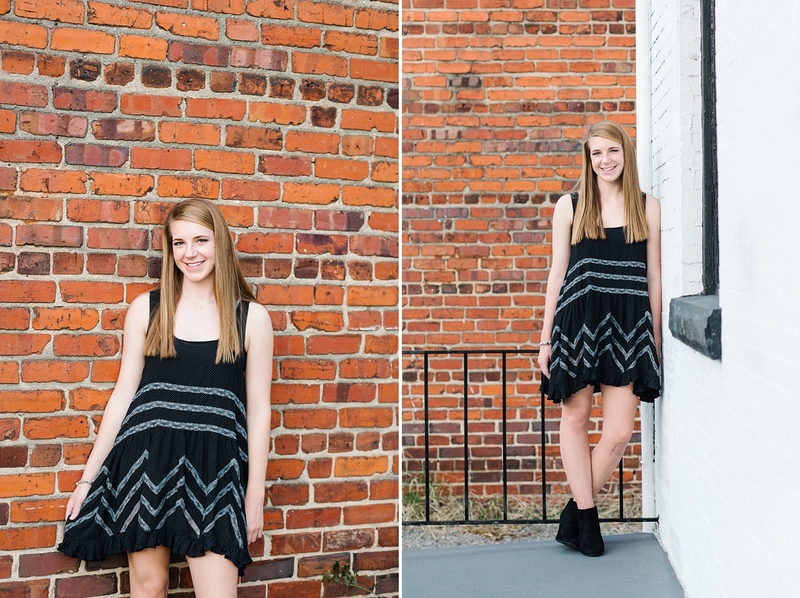 Carytown offers some serious style when it comes to senior portrait locations! This area is known for its trendy shops and restaurants and is perfect for the trendy senior! So many vibrant colors and interesting windows and doorways and it's always fun to find just the right one to coordinate with your outfit. Alleyways and parking garages help add to this gorgeous urban look and feel. 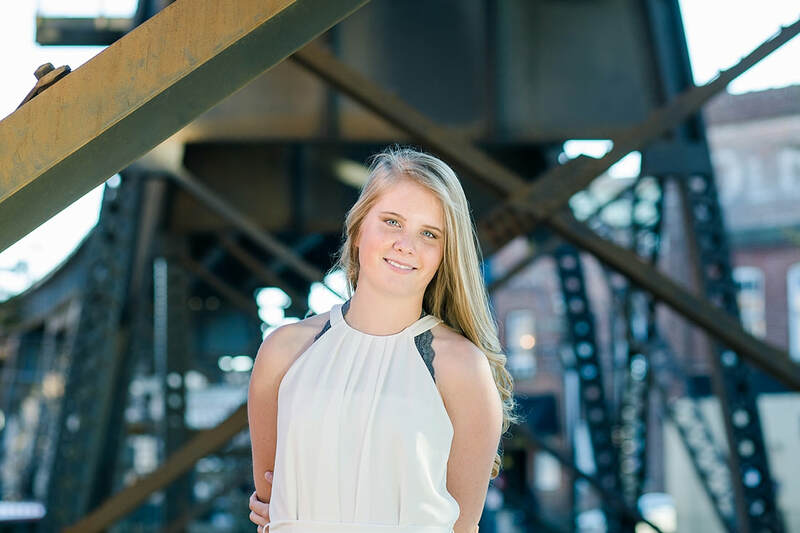 See more Carytown and Uptown senior portraits on the blog! 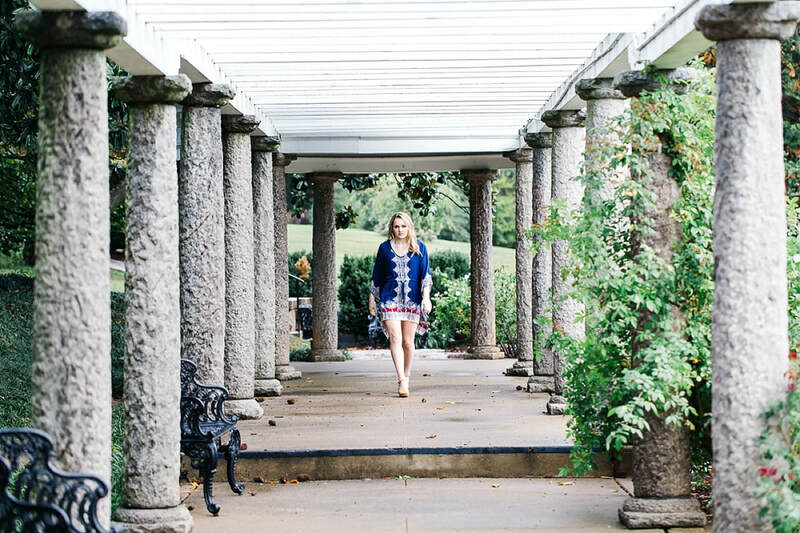 See more Maymont, Dogwood Dell, and Carillon portraits on the blog! 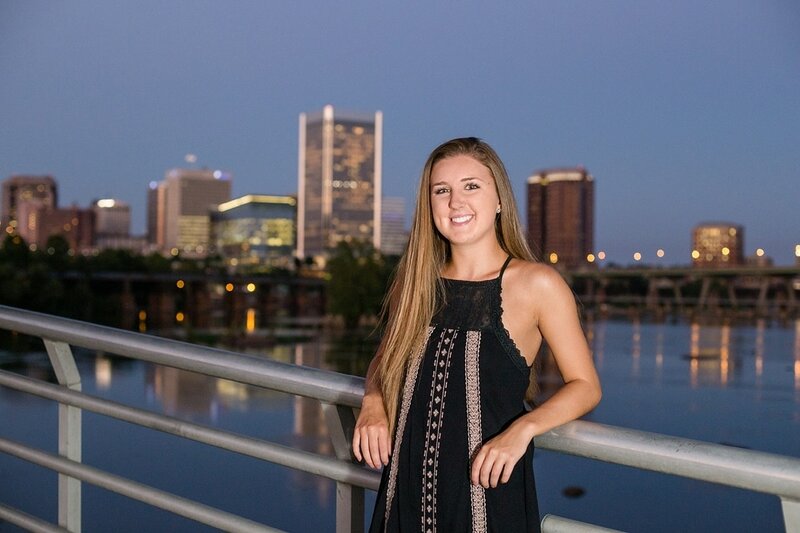 Maybe you're looking for a bit of Richmond's river scene for your senior portrait session? This is one of my most requested locations and it's for a good reason! This area has such variety! We can do murals on the Canal Walk, bridges near Brown's Island, and the beautiful James River at Belle Isle. 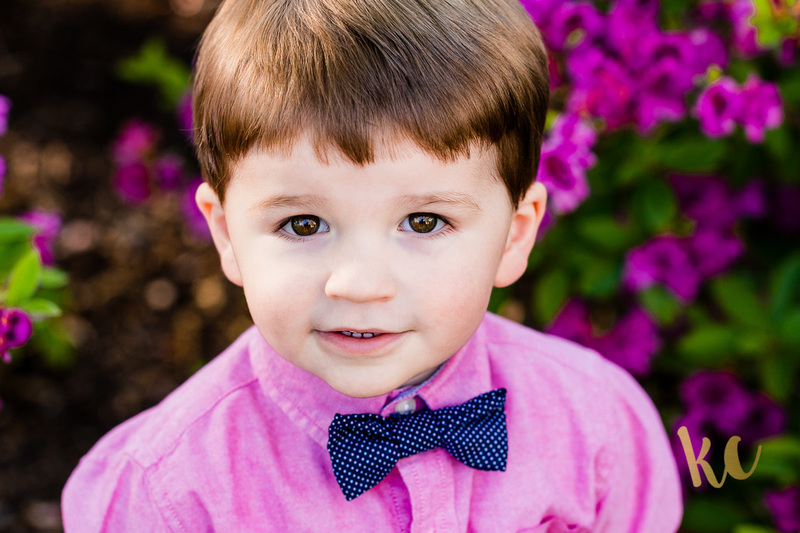 These sessions can run the style spectrum of polished sophistication to super casual. That's why this location works for just about everyone! 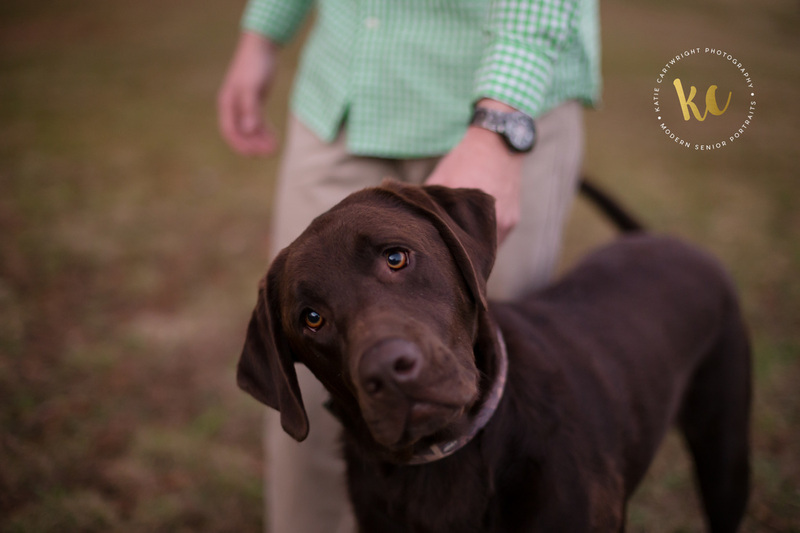 See more Belle Isle, Brown's Island, and Canal Walk Portraits on the blog! 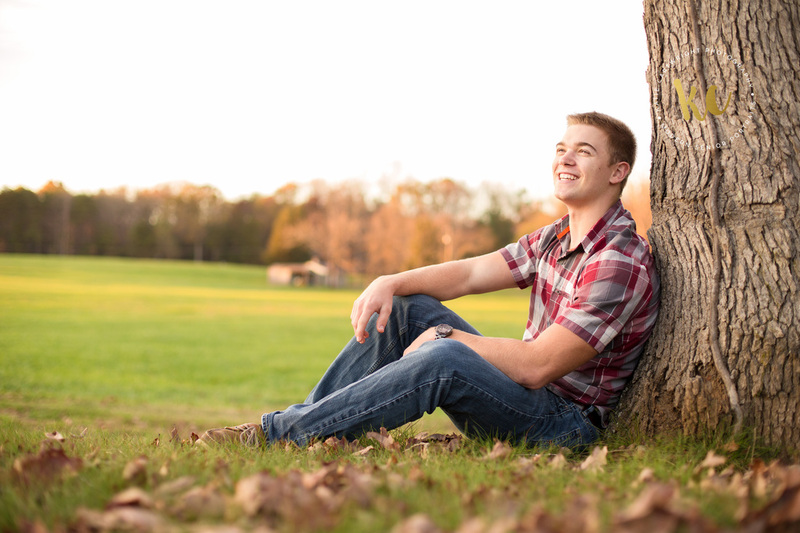 See more Hanover County Parks, Henrico County Parks, and Virginia State Parks Senior Portraits on the blog! 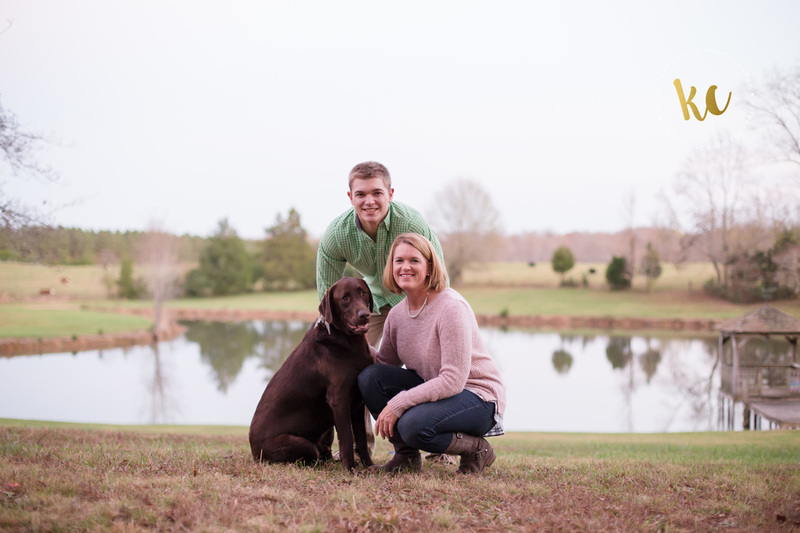 See more Scott's Addition and Shockoe Bottom Portraits on the blog! So, where would you like to go for your session (or just to hang out)? 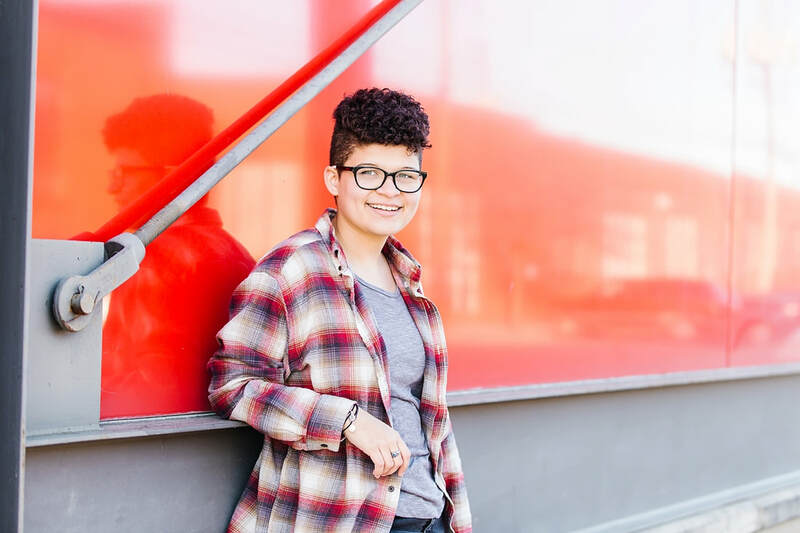 Of course, there are plenty other awesome locations, including church yards, school or college campus, vacant lots, and maybe even your own backyard! 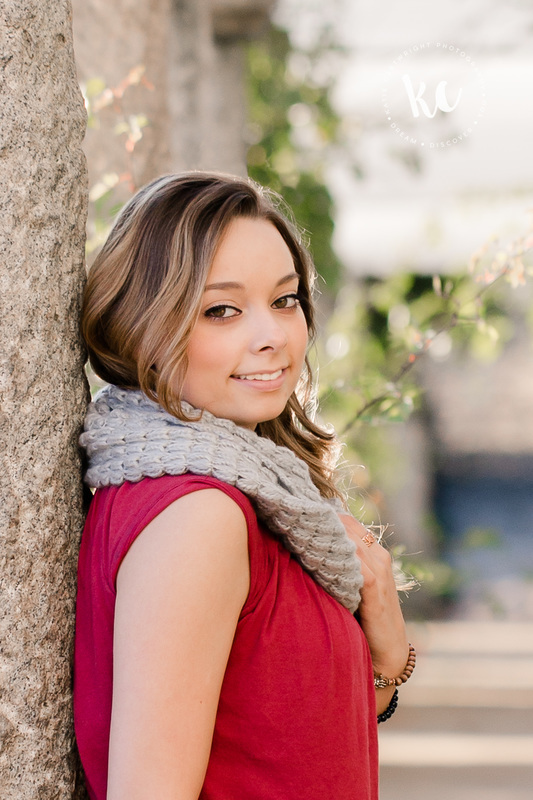 I'd love to chat with you about your session and discover the perfect spot for you! 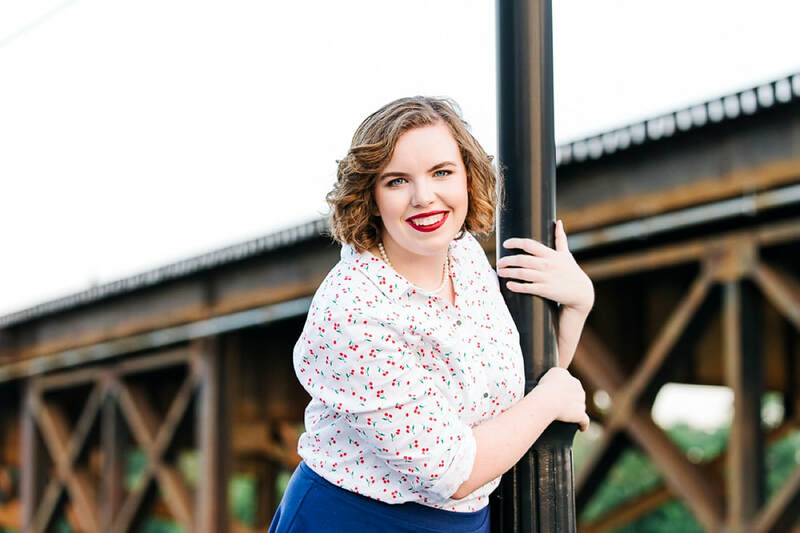 OR, if you're ready to get your date booked, you can book online and I'll help you schedule a pre-session planning meeting to discuss all the details! Meet Haley! 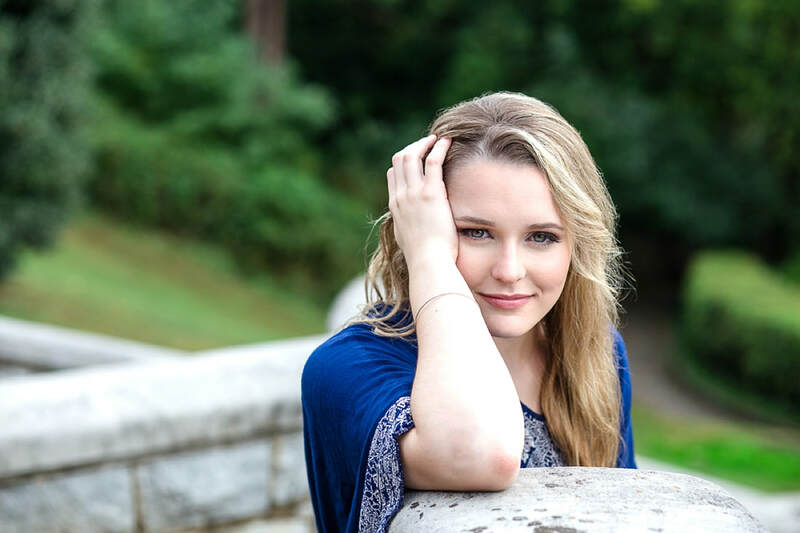 She's a class of 2018 senior at Douglas Freeman High School in Henrico County Virginia and she's this week's blog feature! 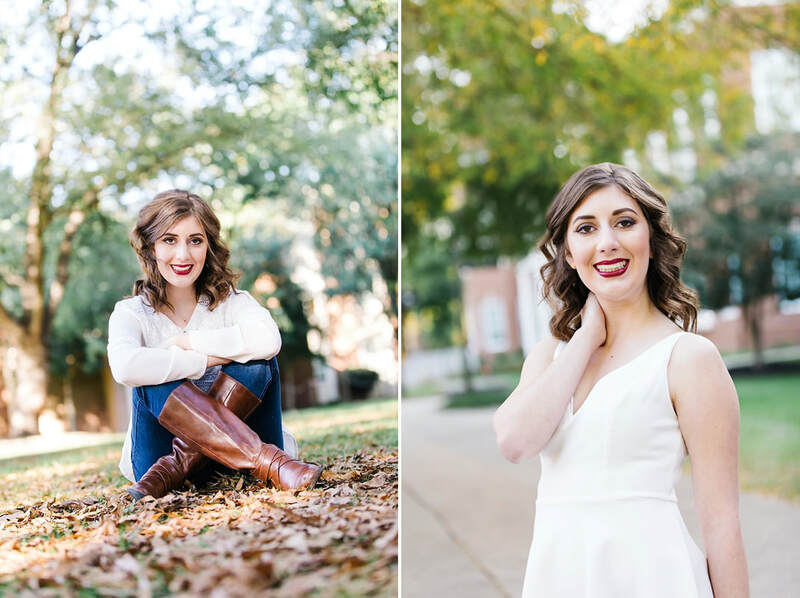 Haley's senior portrait session was a dream y'all! She absolutely nailed all the posing ideas I threw at her and she even came up with a few versions on her own. 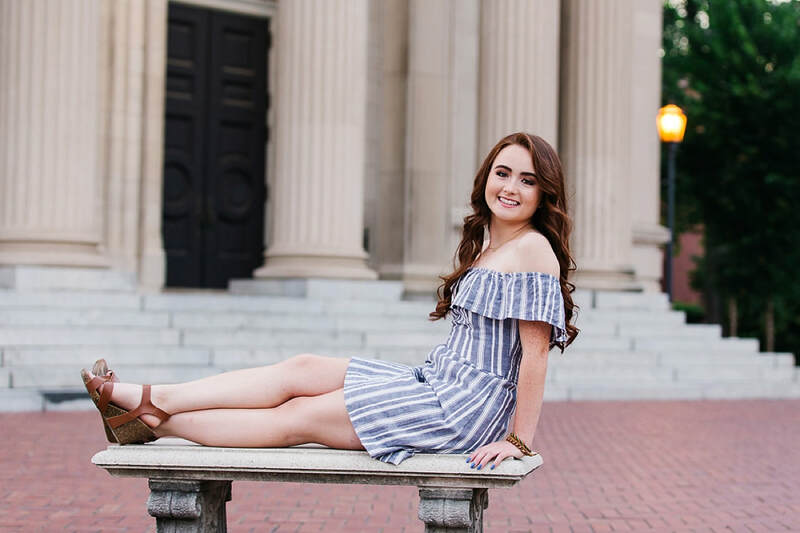 Mix that with trendy styles and a gorgeous college campus, and you get some seriously awesome senior pictures! After that, we did a few photos right outside of the studio in Ashland. Then we headed over to the nearby college campus which never disappoints! Fall colors - check. Beautiful architecture - check. Lush landscaping for dreamy backgrounds - check!! 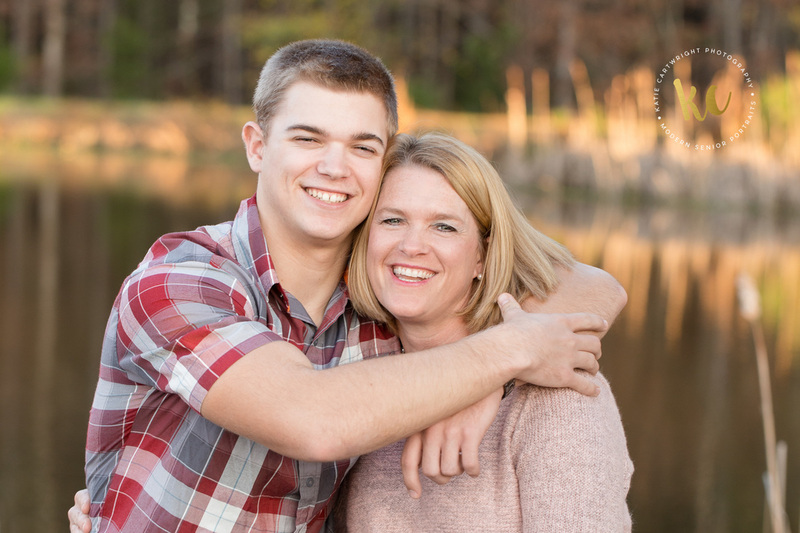 Thanks Haley (& your mom) for choosing me as your senior portrait photographer. I'm truly grateful! 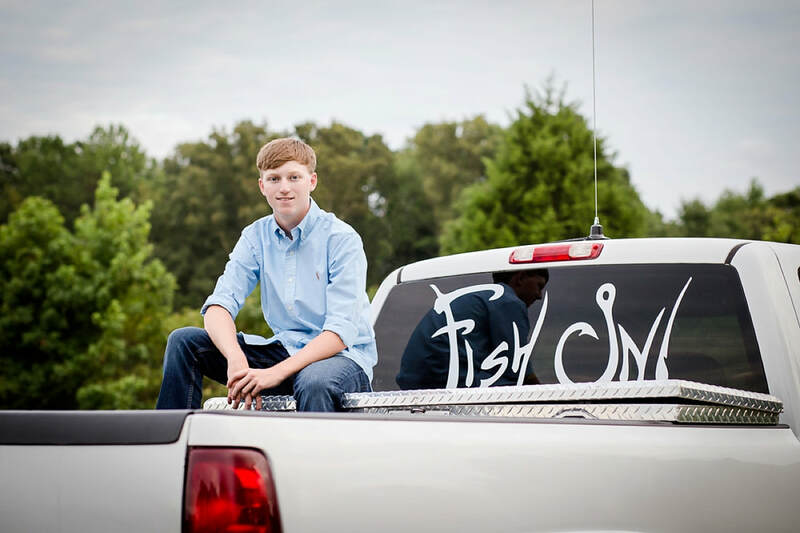 Best wishes as you complete your senior year at DSF! Go Rebels! Meet Addie! 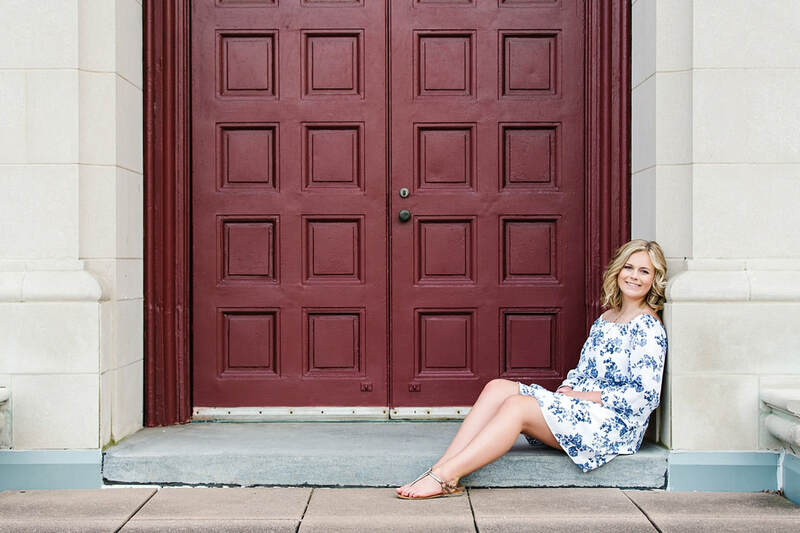 She's a senior at Hanover High School in Hanover, Virginia and she is also one of my Class of 2018 Senior Models! 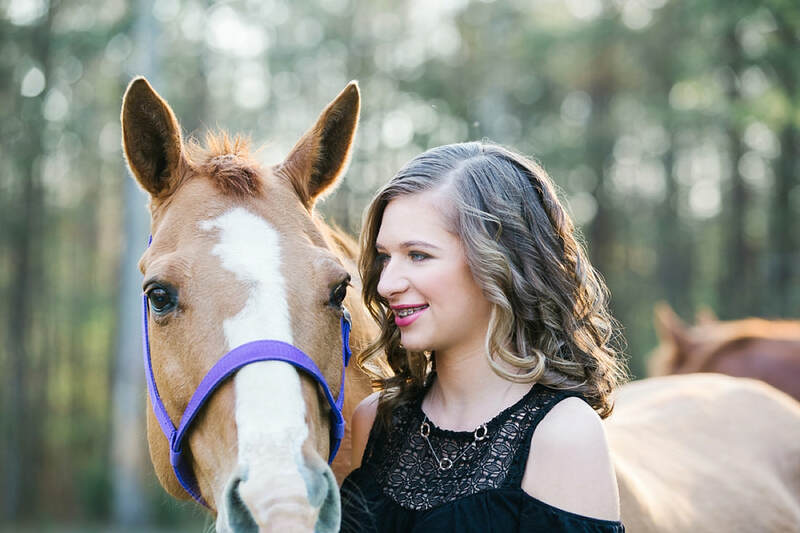 Addie selected the Richmond SPCA as her charity to support through the Hearts to Help Senior Model Campaign and she raised $273.89 to help them with their mission to "practice and promote the principle that every life is precious" as they advocate for animals. 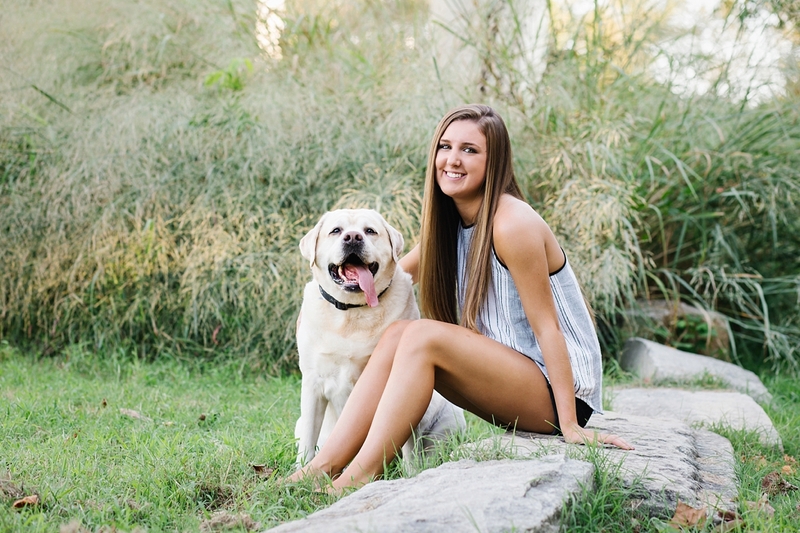 Thank you Addie for joining me in the Hearts to Help Senior Model Project this year! I loved having your smile and sense of humor! 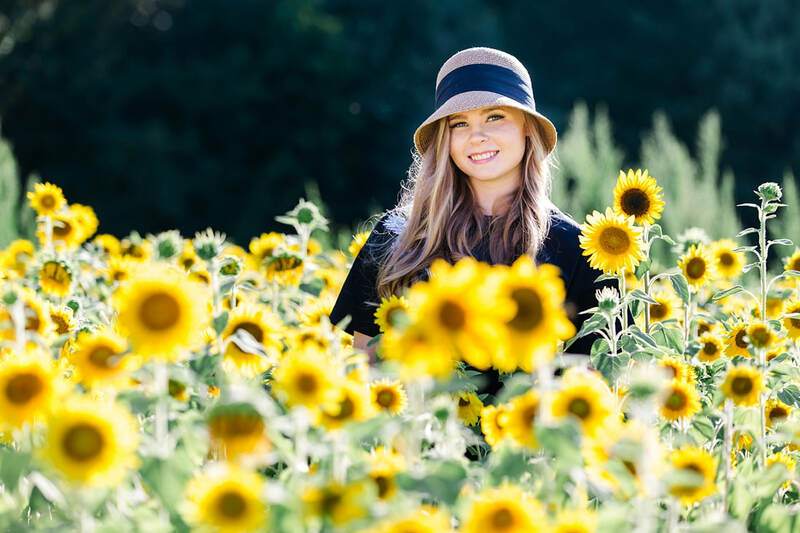 We had a terrific time during her senior photoshoot in this sunflower garden and among the beautiful landscape of her home. 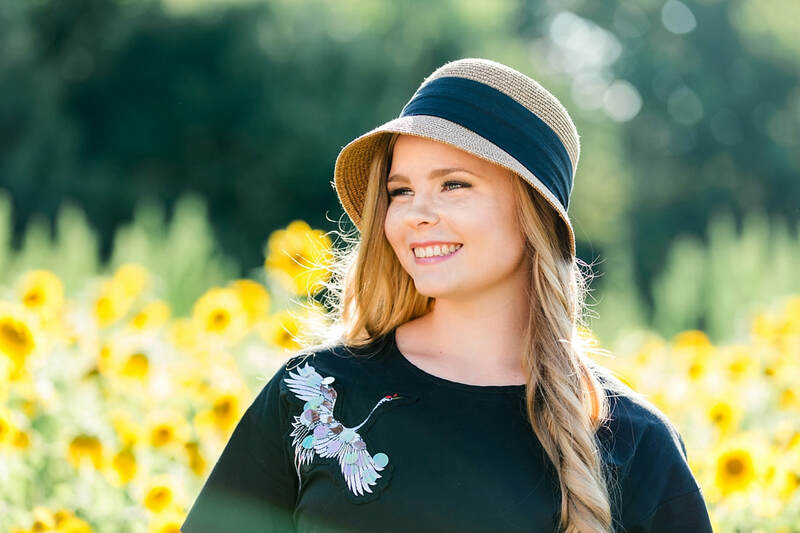 She wore an adorable black dress with a gorgeous embroidered stork and topped it all off with the perfect hat! Once we were done at the sunflower field, we met up at her home. She chose to wear a casual top and jeans for her second outfit and they were a great choice. 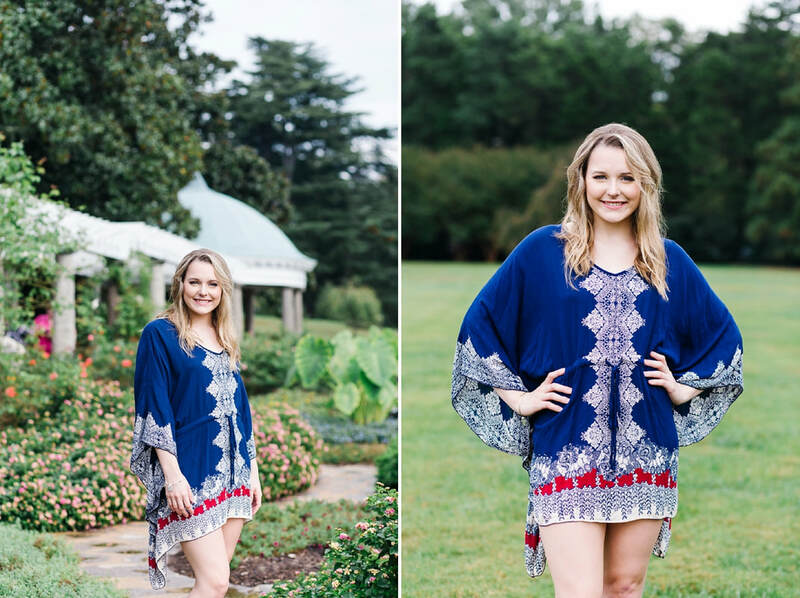 Her mom and dad helped create some beautiful backdrops among their beautiful blooms and landscaping and Addie's natural beauty certainly shined through in this set of photos, too! 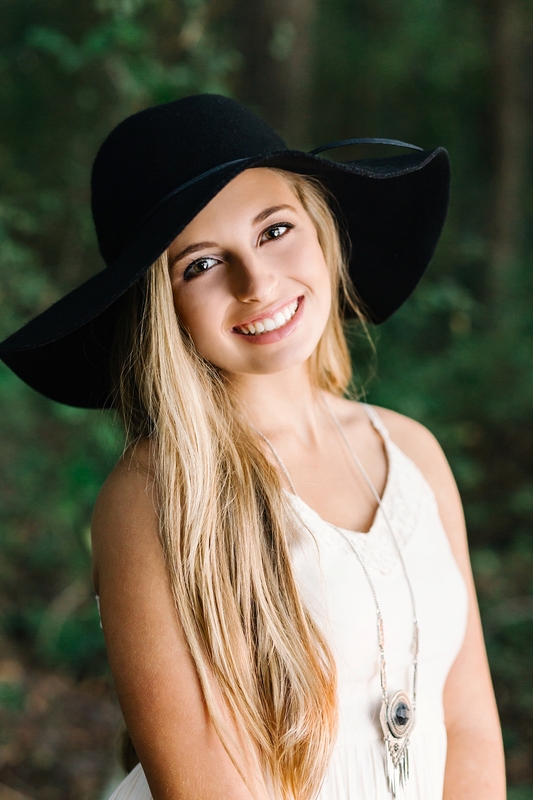 Special thank you to Addie's parents who helped make her backyard session beautiful. Also, to my friend who allowed us to use her gorgeous sunflower garden! 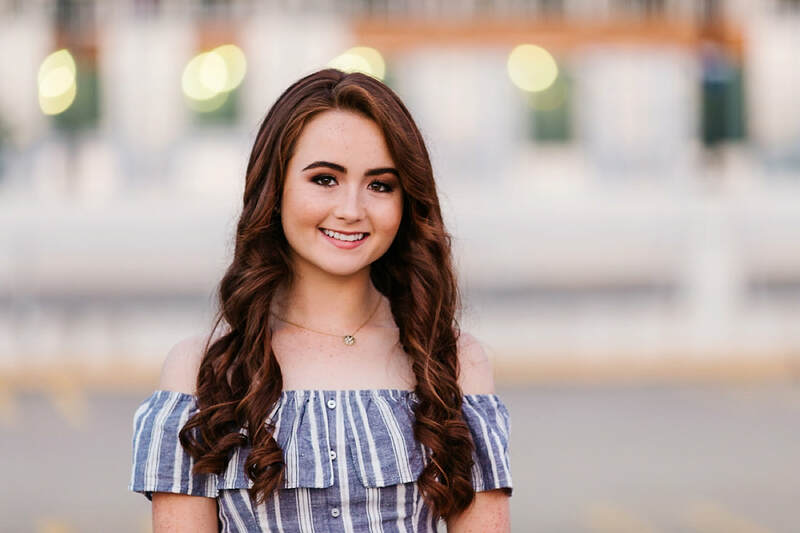 Addie's hair and makeup was done by KC Rosey at Bobbiepins & Blush. 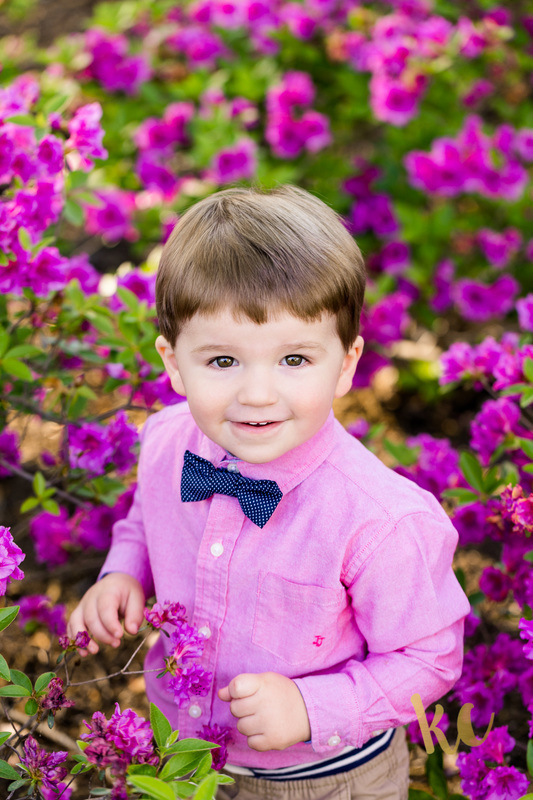 Want to book your spring or summer garden portrait session? 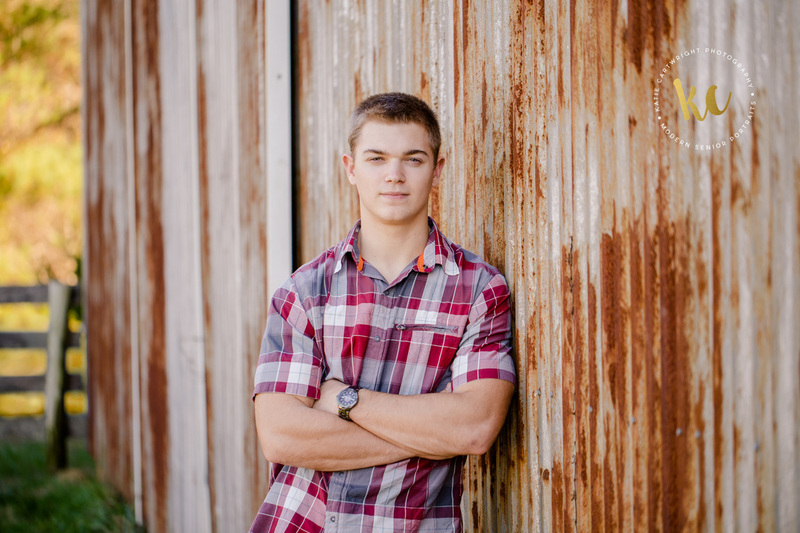 Check out the link to Seniors (top menu) or contact me! Meet Laura! 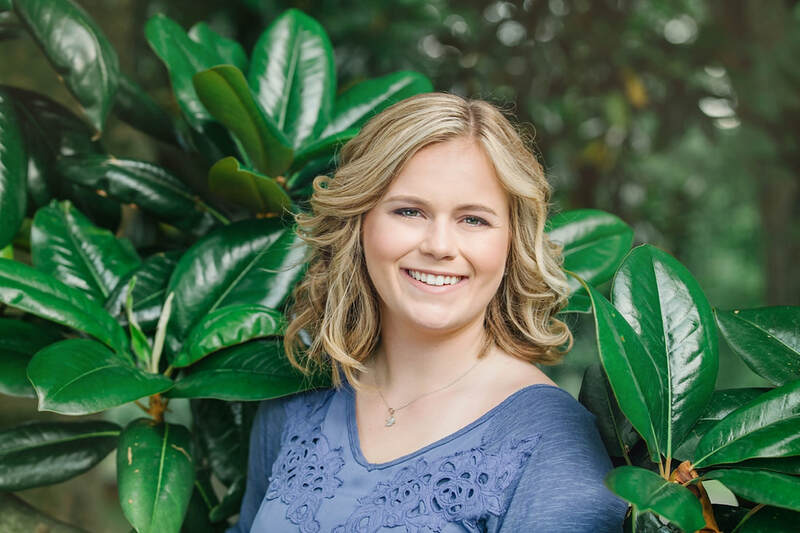 She's in the senior class of 2018 at Hanover High School and I was thrilled to photograph her senior portraits! 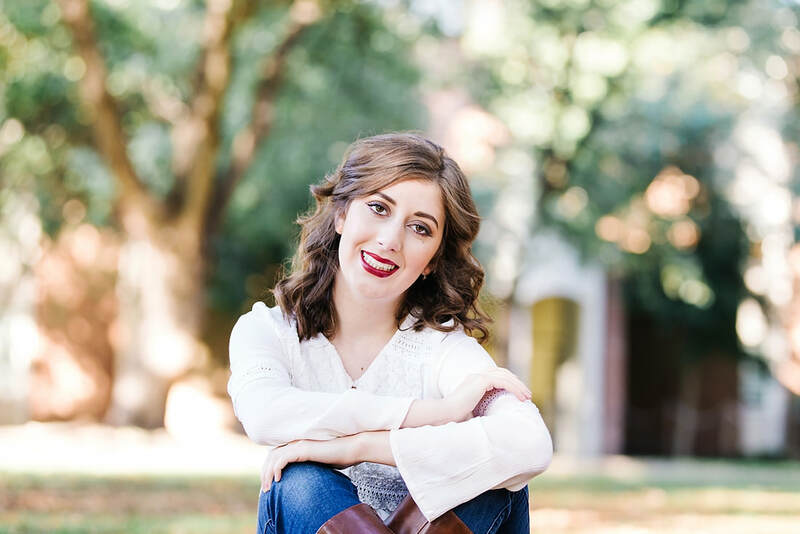 I had the pleasure of spending a week with Laura on a mission trip in Haiti this summer and I'm here to tell you that this girl is not just bold in her style and personality, but she is bold in her faith! Oh do we have some stories to share about that trip, like the time we rode for hours in the back of a truck going up the mountain on a bumpy gravel road, packed in like sardines and wearing bed sheets to keep the dust off of us. Or the time she shared the Word with a Haitian man who did not go to church and eventually lead him to want to know Jesus more. 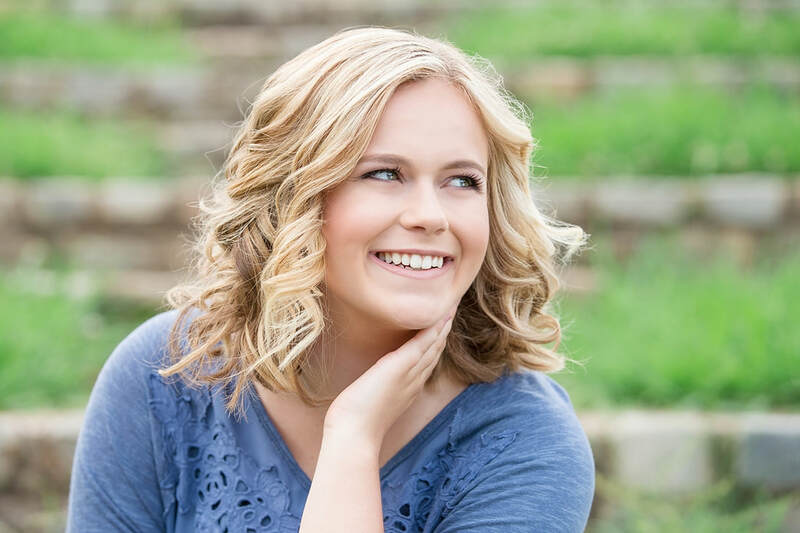 It was wonderful, which made her senior portrait session even more special to me. Laura had unique ideas about the style of her senior pictures. 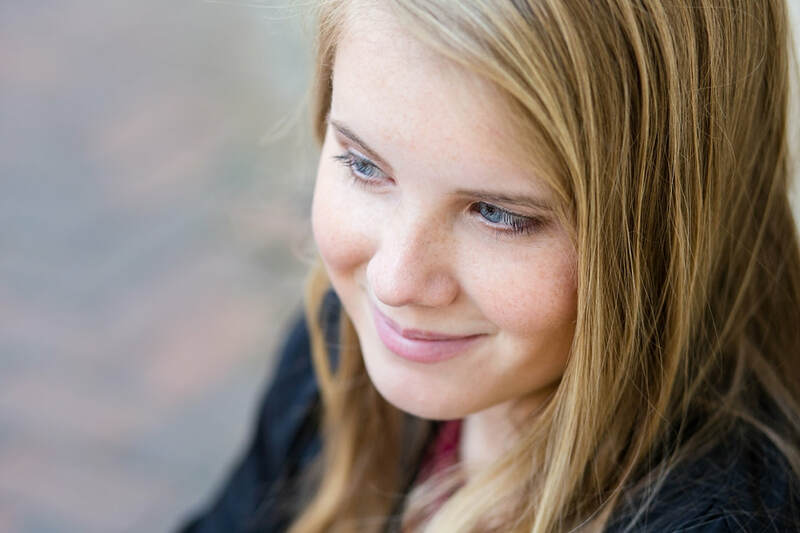 As we chatted during her consultation, it became clear that she knew exactly what she wanted, and it was going to be a little different than my other sessions. 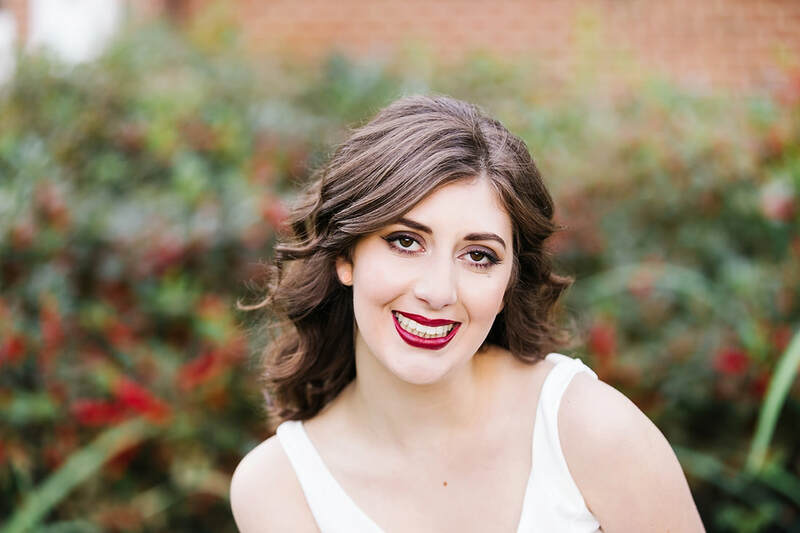 Her location of choice was Shockoe Bottom near the Holocaust museum in Richmond, VA and I was thrilled to shoot in a new location! This downtown area is a gem, full of unique spots, which allowed us to get so many different backdrops for her amazing outfits. Her blue dress was stunning and we had so much fun dancing and twirling in it (well, she danced and twirled, I just took pictures of it). Her second outfit was a blue skirt paired with a button-up top with cherries all over!! How fun is that? She looked just beautiful in every outfit and every pose. Speaking of poses, they were more like actions and she kept me laughing the whole time with her little spin on my directions. She added her own style and personality into everything I asked of her and it was fabulous. 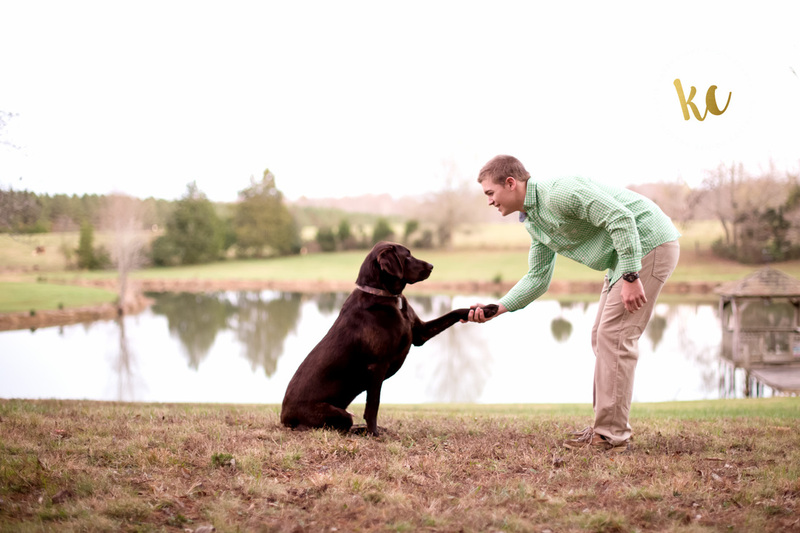 From the moment I met Chloe, I knew she was a people person. With her sweet smile and her way with words, she makes friends quickly. She's not just sweet, she's smart, too and a natural leader. 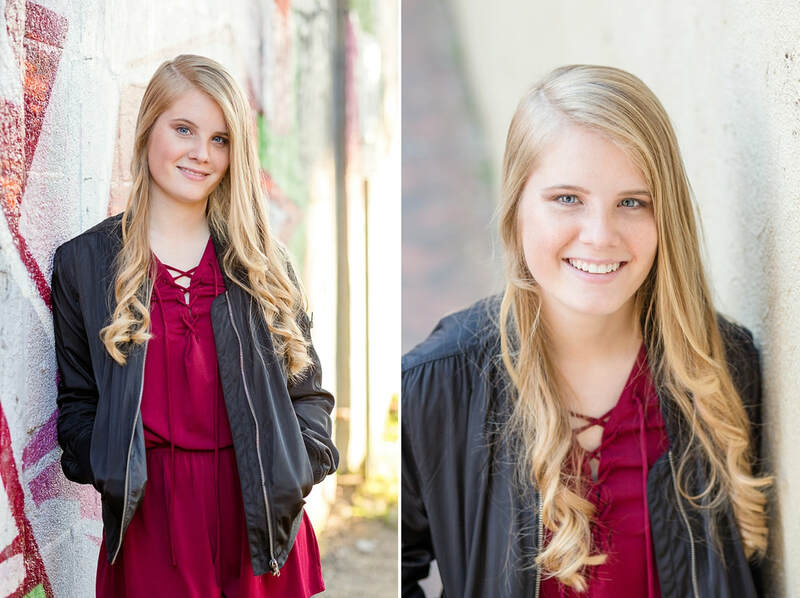 I loved hanging out with Chloe and hearing more about life at Goochland High School where she plays soccer and is active in many student organizations. Chloe wanted to go somewhere that offered a city look, but also wanted some greenery to mix things up and have some variety. The VCU area of Downtown Richmond ended up being the perfect spot! 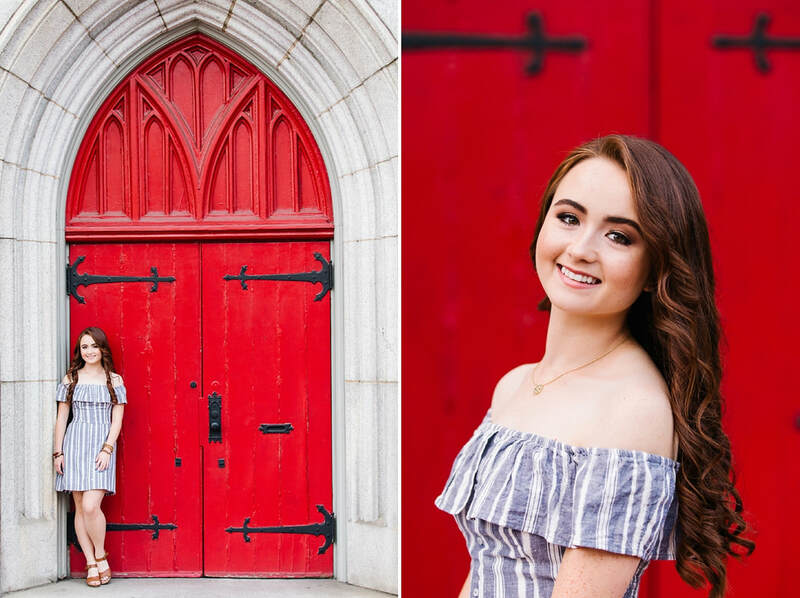 After getting the full hair and makeup treatment from Cameron and Stacey, we headed downtown and found some really awesome spots to complement Chloe's amazing outfits! 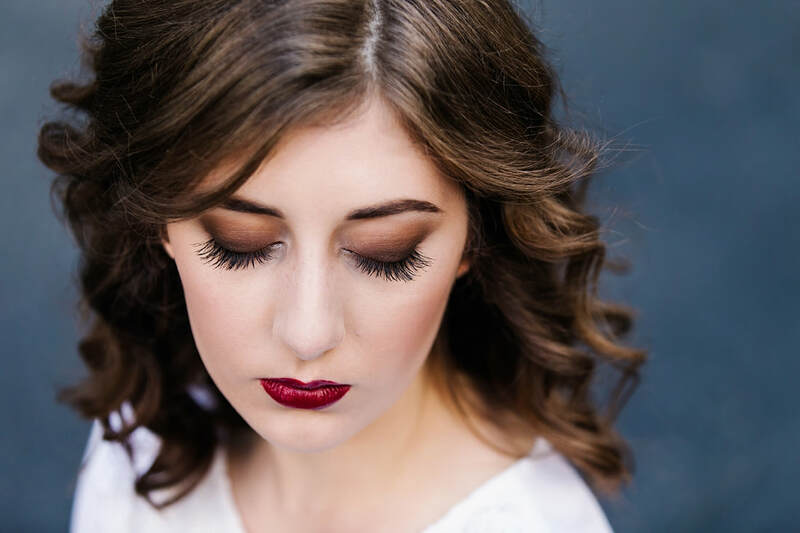 I just love the many different looks we were able to create in just a few hours of shooting time. 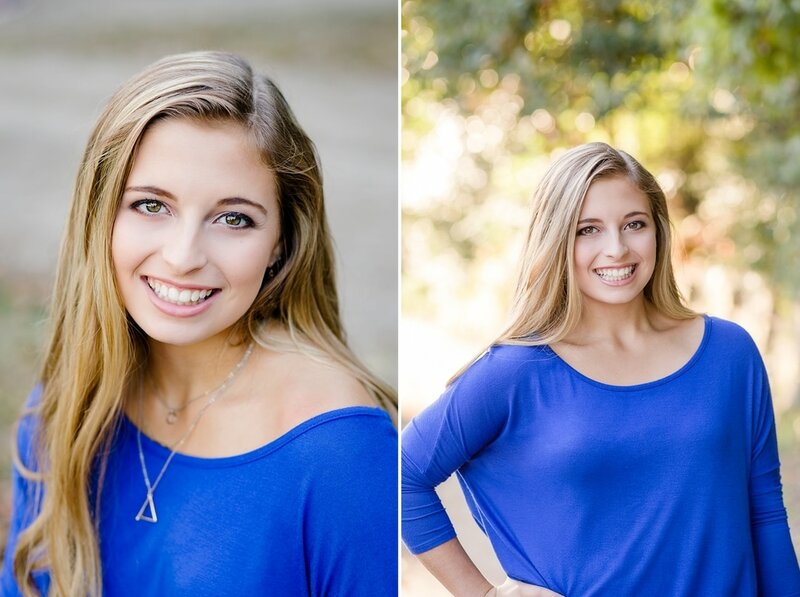 Chloe, thank you so much for trusting me to create your senior portraits! What a fantastic time it was! Update! 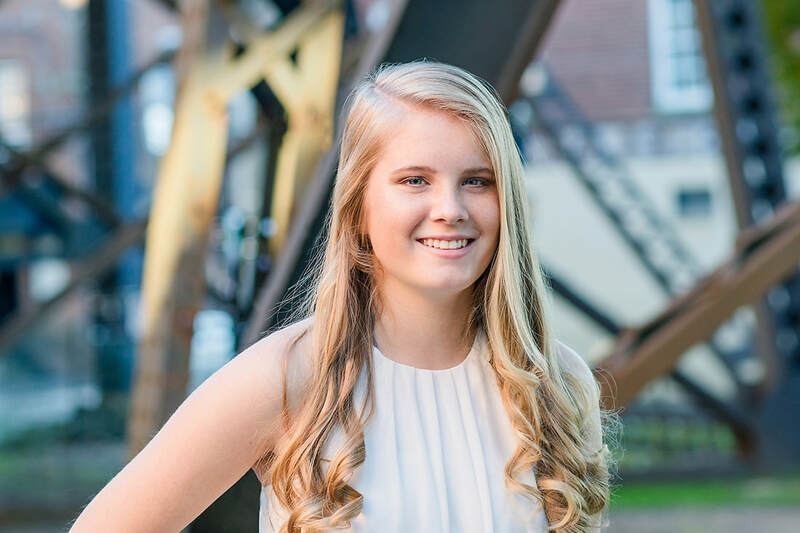 Chloe helped raise $100 for The National Suicide Foundation - Richmond Chapter through her Hearts to Help Senior Model Project! Way to go Chloe! Thank you for being a part of this campaign! 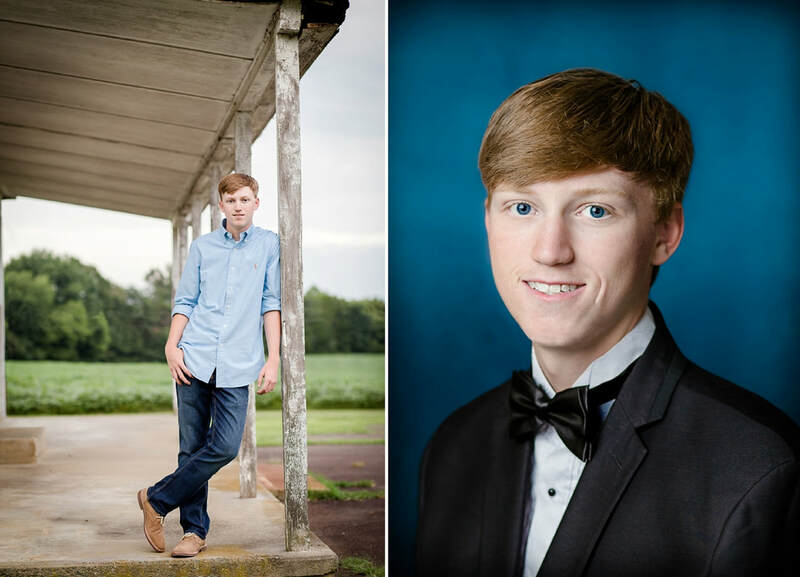 Are you ready to book your senior portraits? 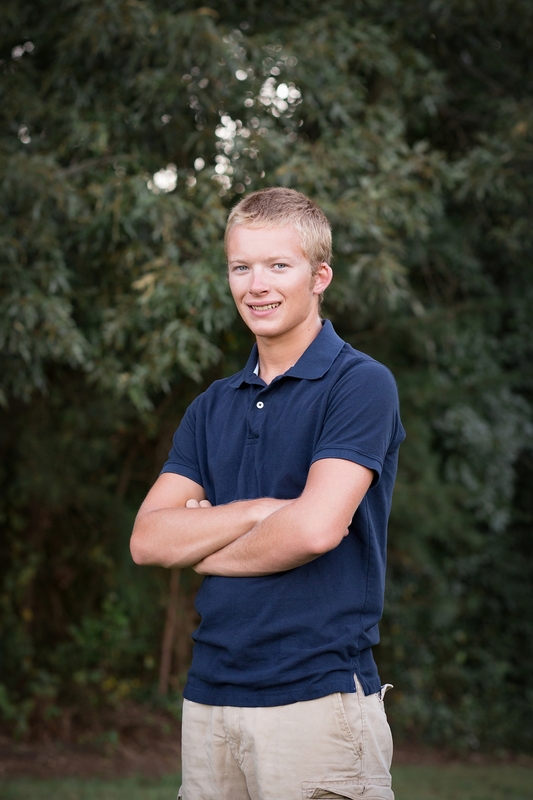 I'd love to work with you to create an amazing senior portrait experience. 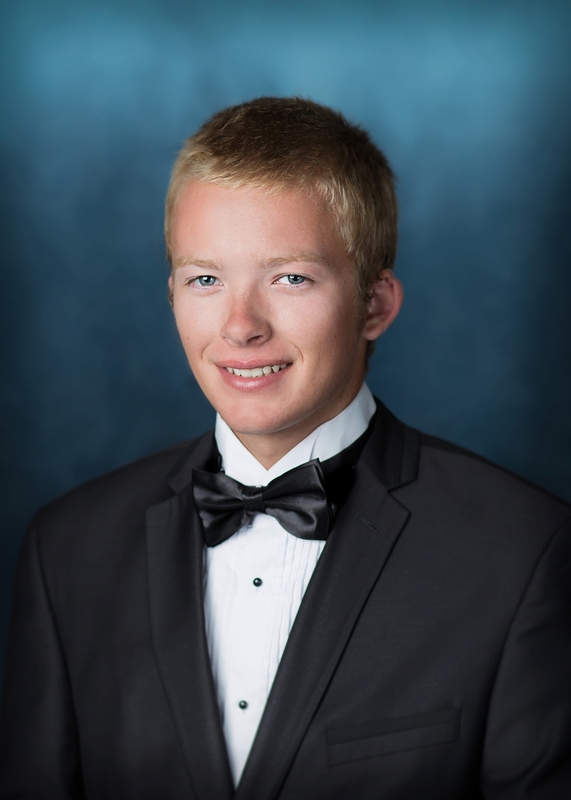 If you'd like to find out more about the senior portrait experience, you can download the Senior Portrait Guide or if you're ready to book, just fill out the CONTACT form to get information on availability. 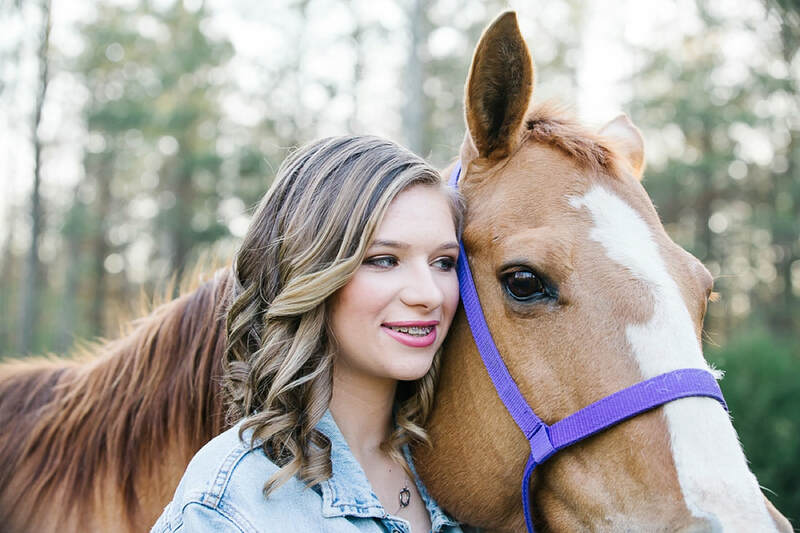 When Patrick Henry High School senior, Danielle, told me she wanted to do her senior pictures with her horse, I knew it was going to be an awesome time! 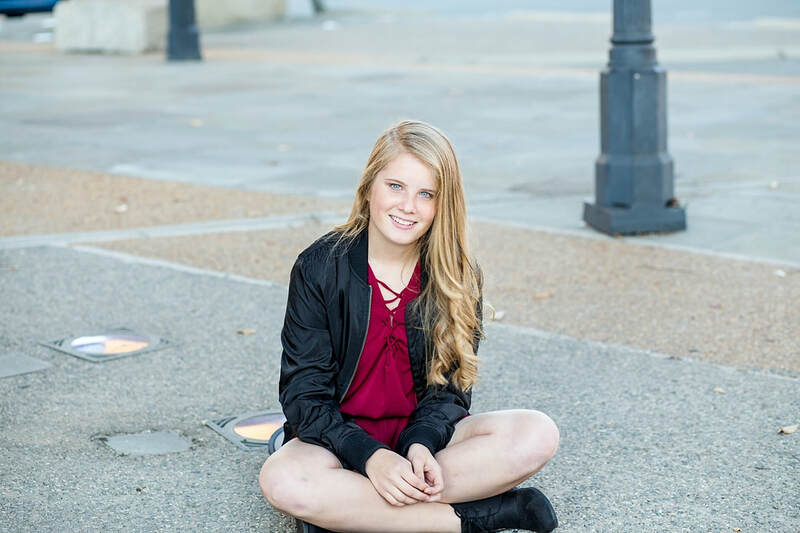 On her session day, she was pampered with the hair and makeup treatment and she loved how it turned out! Once she was camera-ready, we ventured out to the Montpelier horse farm where she boards her sweet horse. What a gorgeous place it was on this gorgeous spring day in April! 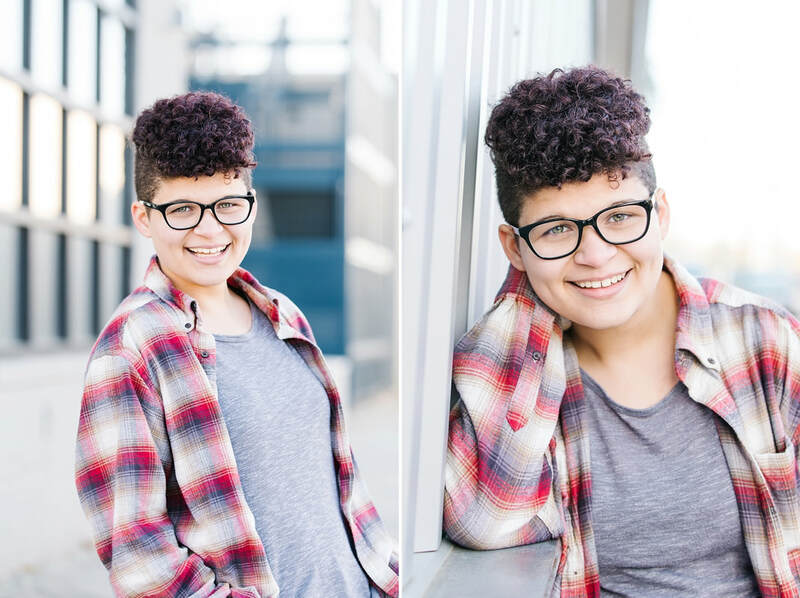 Danielle was a little quiet at first and super sweet, but once we got to work, she came right out of that shell and she was amazing! 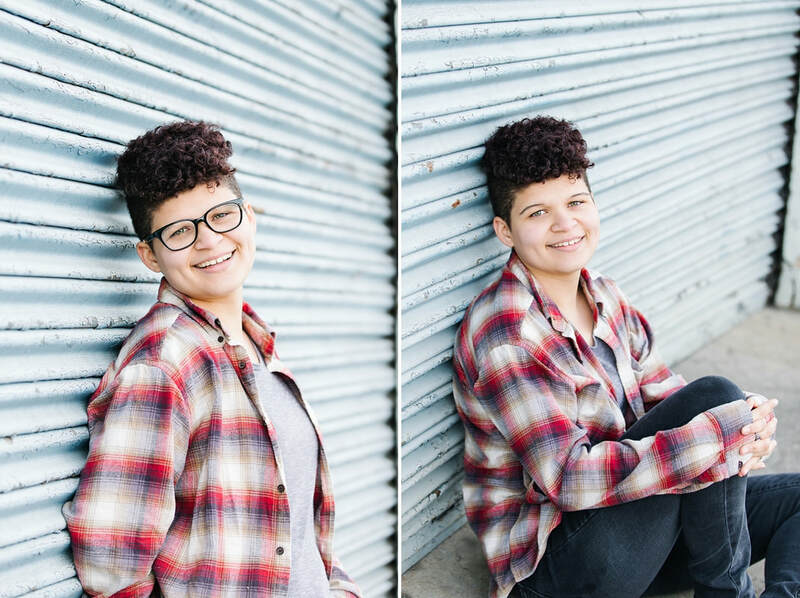 She was a joy to photograph and I love that we had such great light that day! 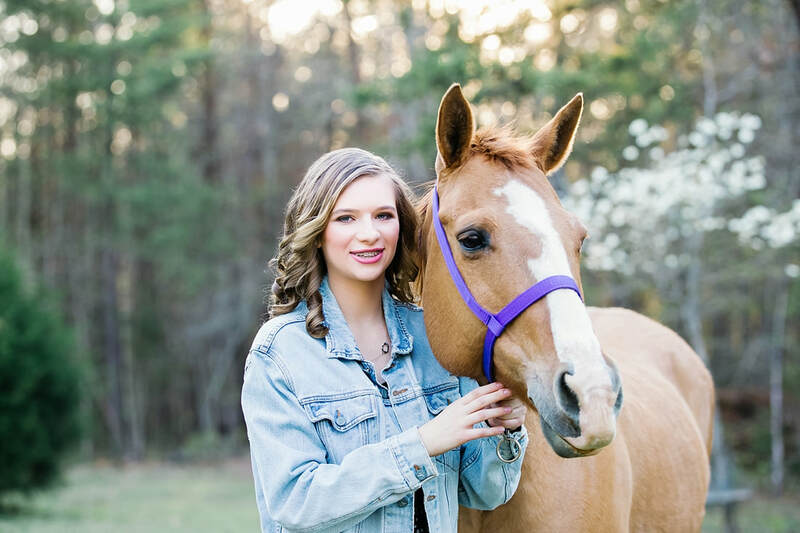 Once we got some individual photos of Danielle, we had the horse brought around and we worked hard to get these awesome photos of her with him. Horses can be tricky to photograph, but she did make it all look easy, didn't she? 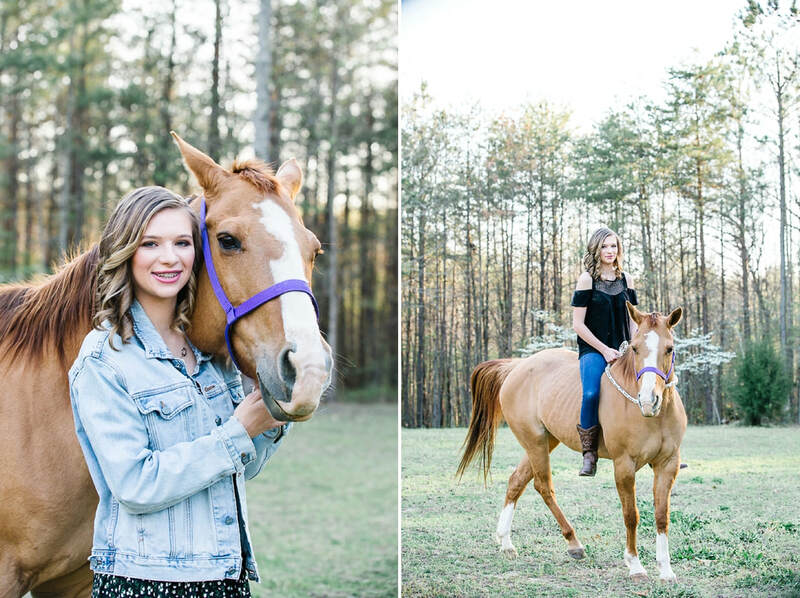 So, Danielle - I'm so glad we were able to do this senior portrait session with your horse in Montpelier, VA! What a great time and I just love the photos! 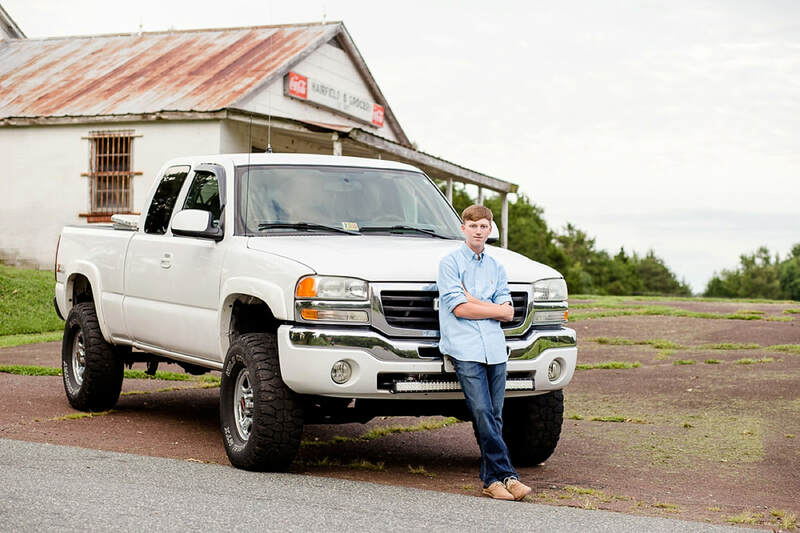 Best of luck to you as you finish your senior year at Patrick Henry! 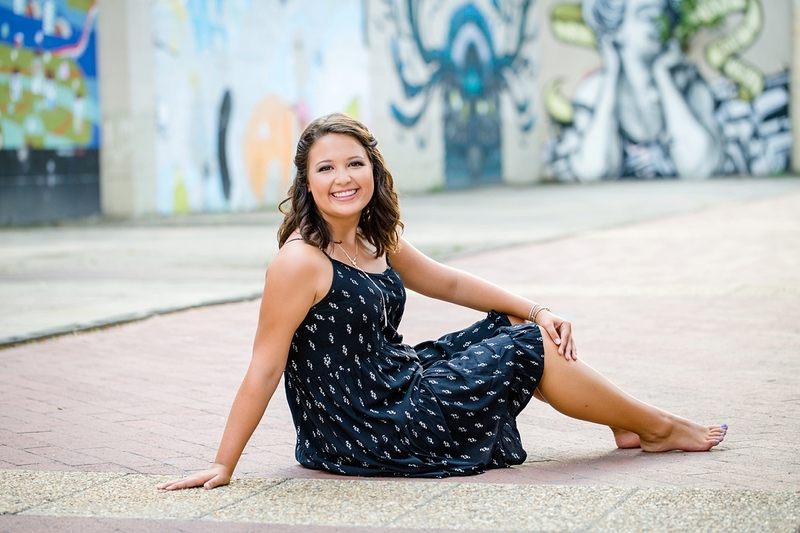 Kylee kicked off my senior portrait sessions for the year and I loved using this Richmond area location! We decided to something urban but a little more unique than the typical shockoe bottom/canal walk/belle isle set. So, we headed over to Scott's Addition and it did not disappoint! We hadn't realized Shamrock the Block was also going on that day, so traffic was a bit unfun, but it all worked out. Kylee had her friend on scene to help out, but she didn't need much to get her showing off her smile. Her range of expressions was my absolute favorite! From smiling, to giggling, to serious, and then playful. 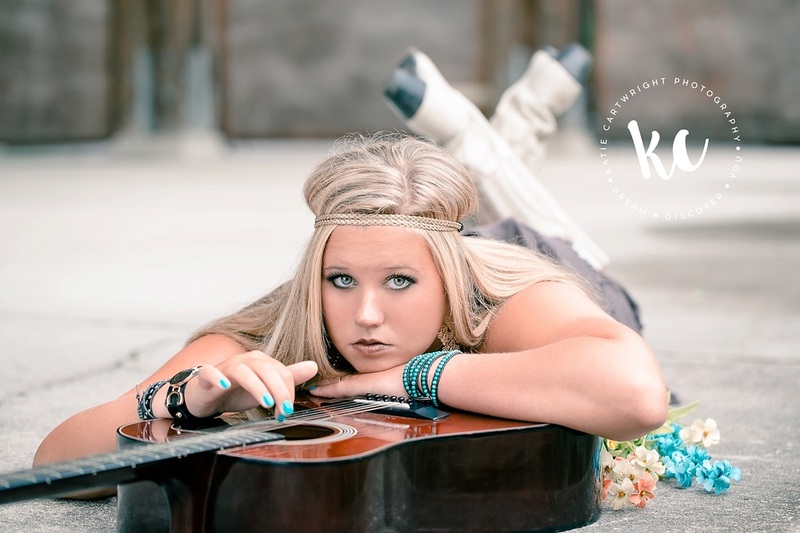 Thanks for being YOU, Kylee - this was a great session and I love your senior pictures! It's Kaelyn! 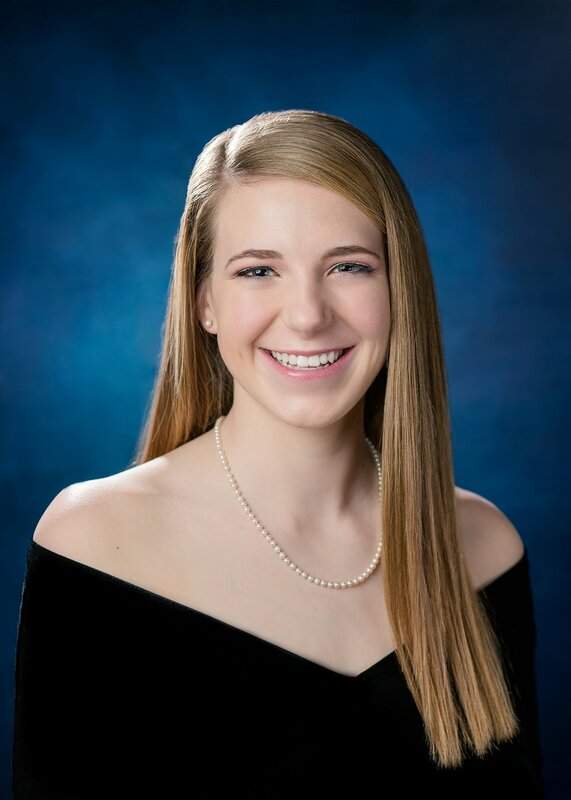 She's a senior at Lee Davis High School in Mechanicsville, Virginia, graduating with the Class of 2017! 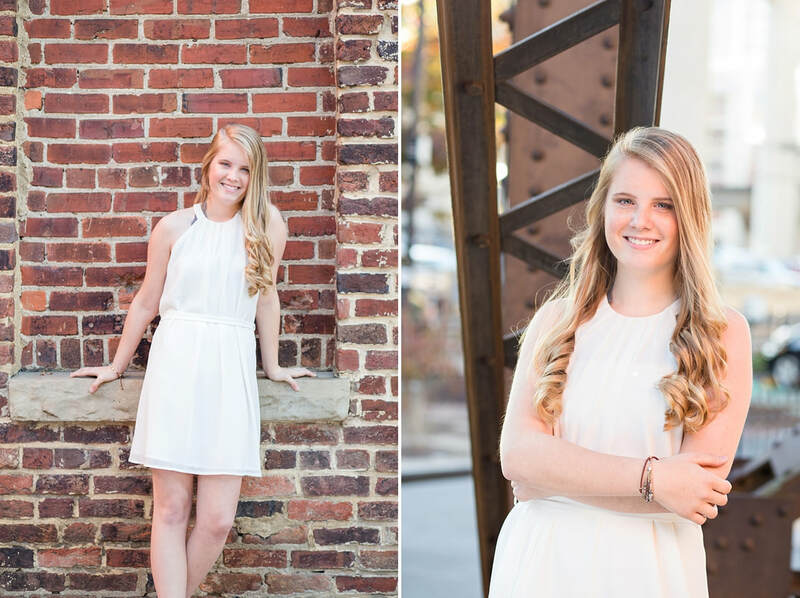 She chose Main Street Station and surrounding Shockoe Bottom area for her senior session and it was a beautiful day! 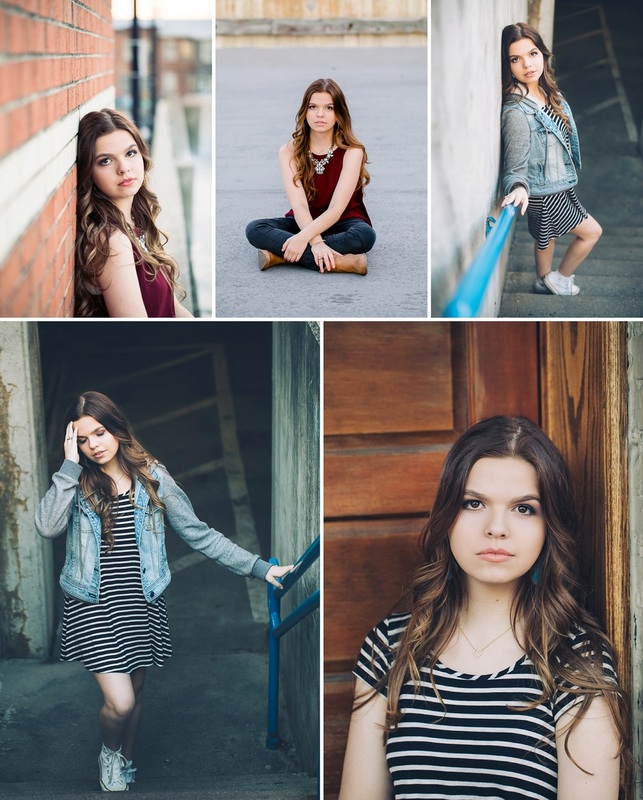 This area provides some great spots for portraits and Kaelyn nailed every pose! 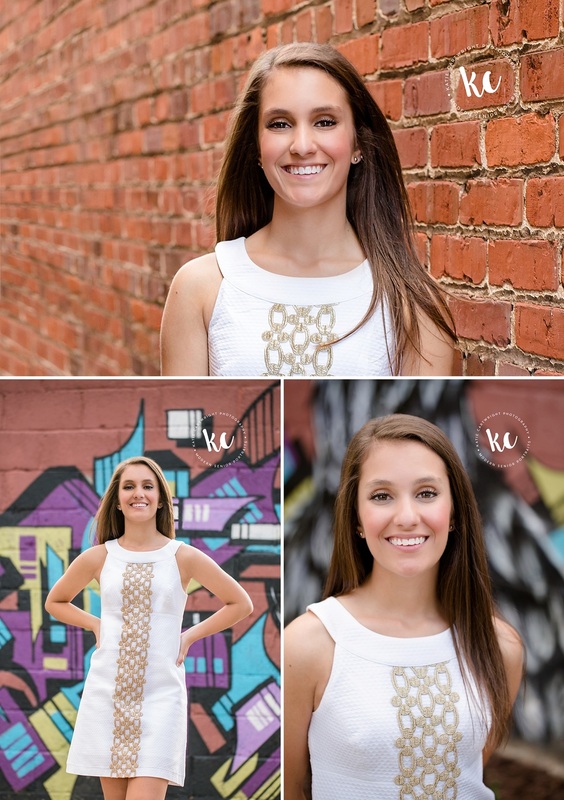 That smile and those awesome outfits make this one of my favorite Shockoe Bottom sessions! 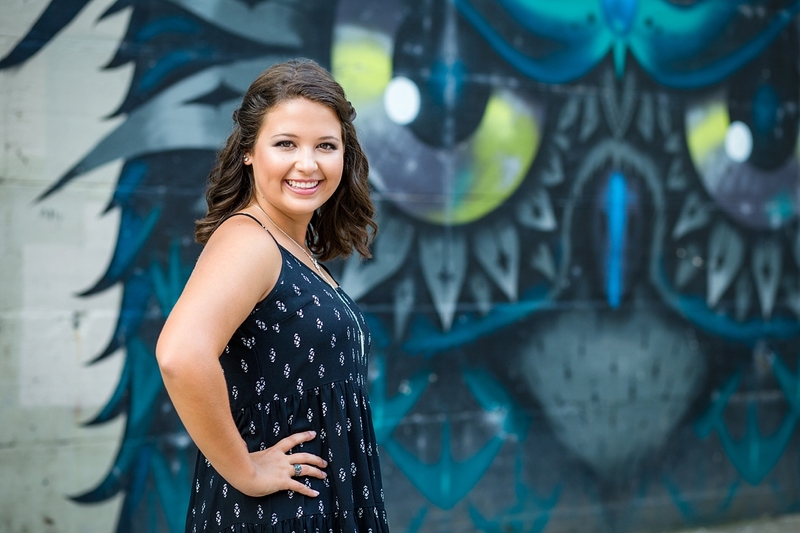 We had some fun under the train track overpass, around the nearby murals, and along the different walkways and parking areas - a true urban portrait session! 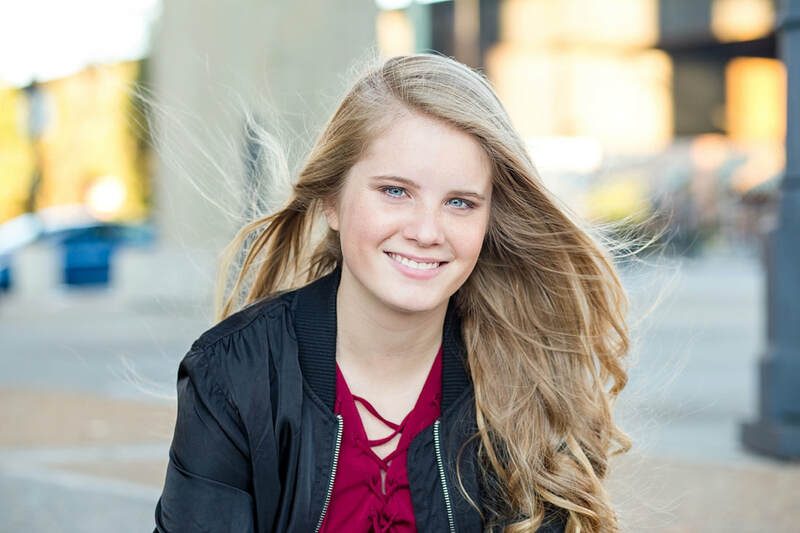 Thanks for being awesome, Kaelyn! This set was just perfect and a great way to end my senior portrait season for the Class of 2017! Special thanks to Waves Hair Studio for the awesome hair (Stacey) and makeup (Shante)! 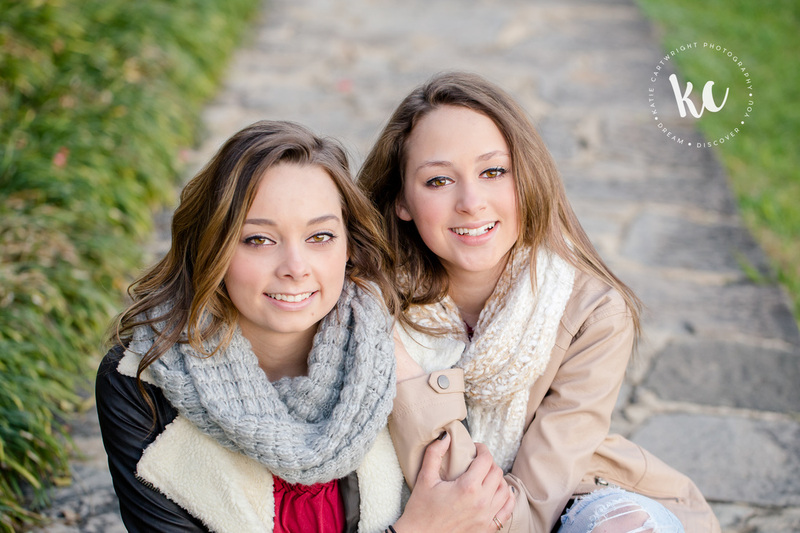 They always do a terrific job and help my seniors look their best! And a special shout out to Kaelyn's mom for helping out behind the scenes today! 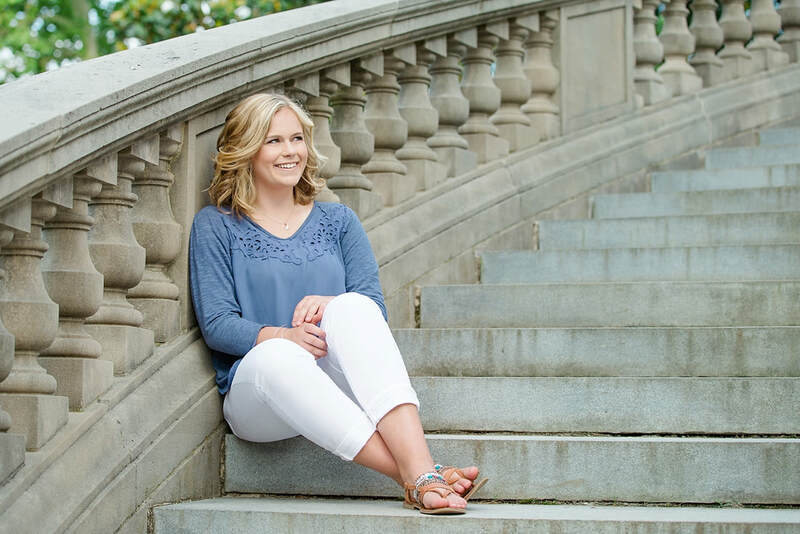 What a day we had at Meghan's Maymont senior portrait session! The weather was gorgeous and the light was perfect for her stylish and relaxed look. 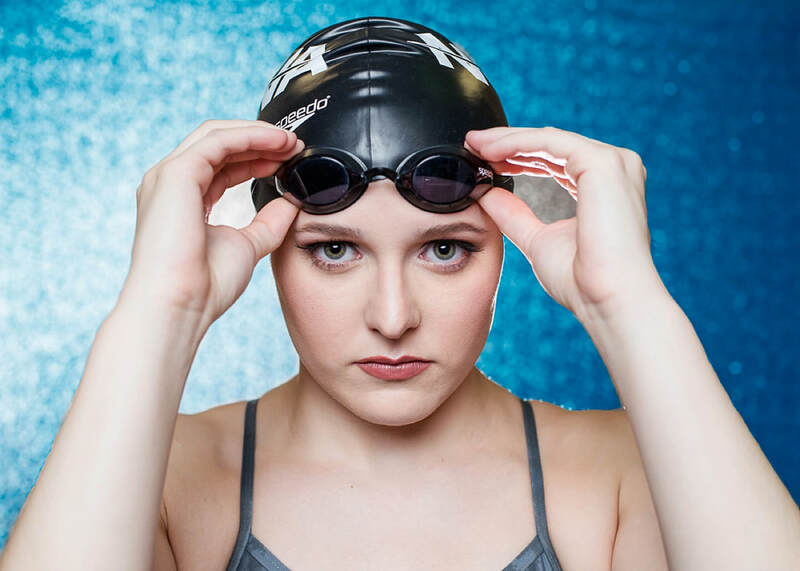 Meghan is a senior at Trinity Episcopal High School in Richmond VA and is also an All-American swimmer with NOVA. We were able to do a couple studio shots in her suit, cap and goggles (shown at the bottom of this post) before we headed out to Maymont. 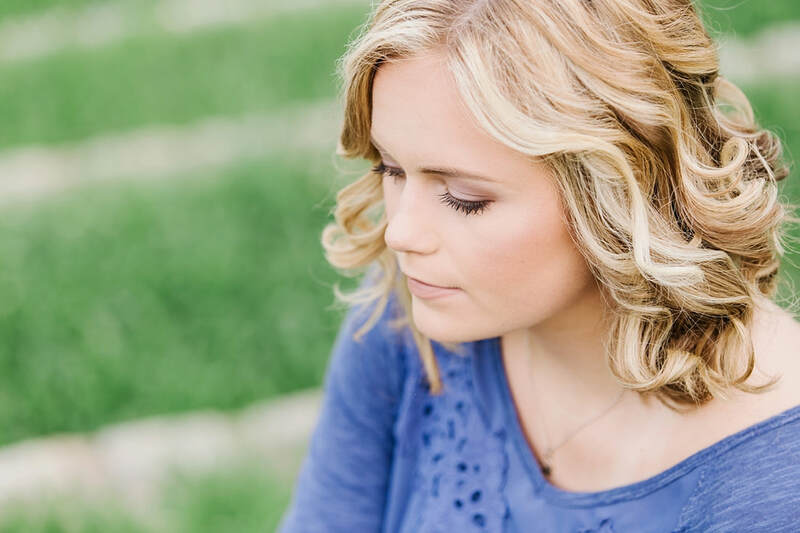 Thanks to Ashlyn of Transformation Artistry for her perfect makeup and gorgeous hair! 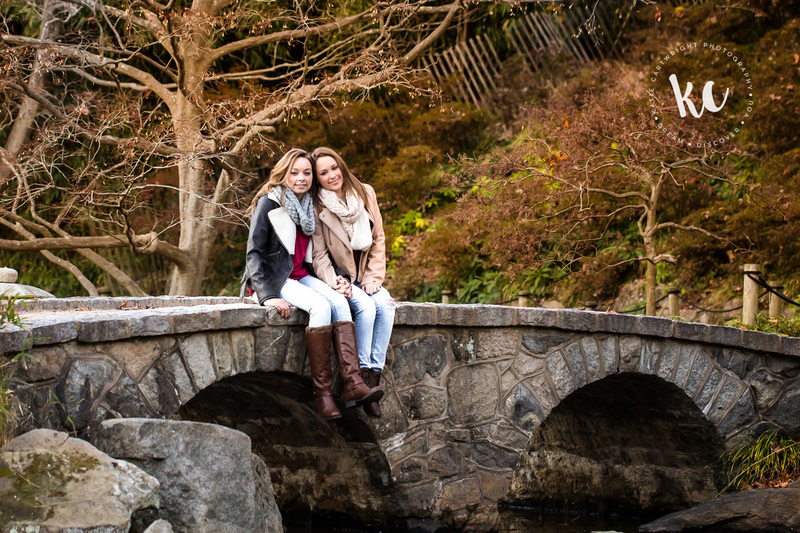 Once we were at Maymont, we explored the gardens at the mansion, the Italian Garden (ahh! ), and the Japanese Garden. 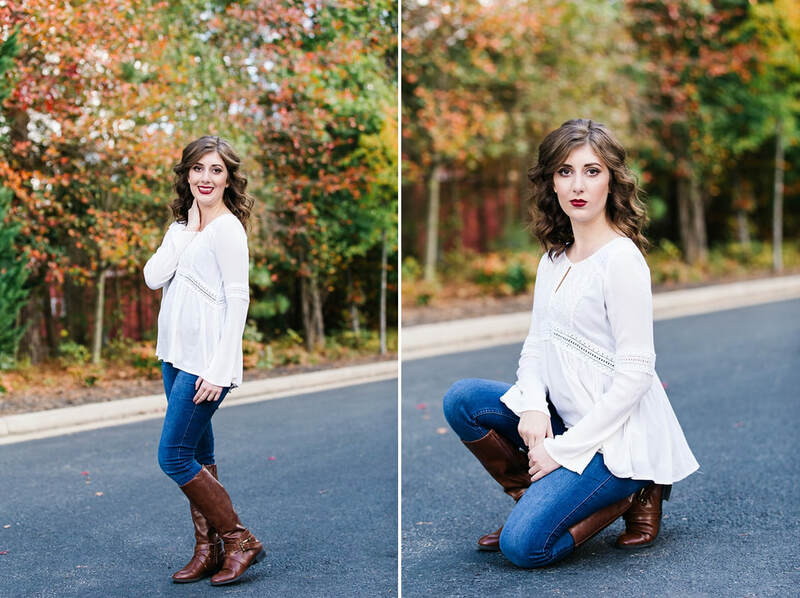 I enjoyed working with Meghan to get a mix of traditional poses as well as some fun movement shots. I loved all of her outfits, but that blue just made her blue eyes pop! 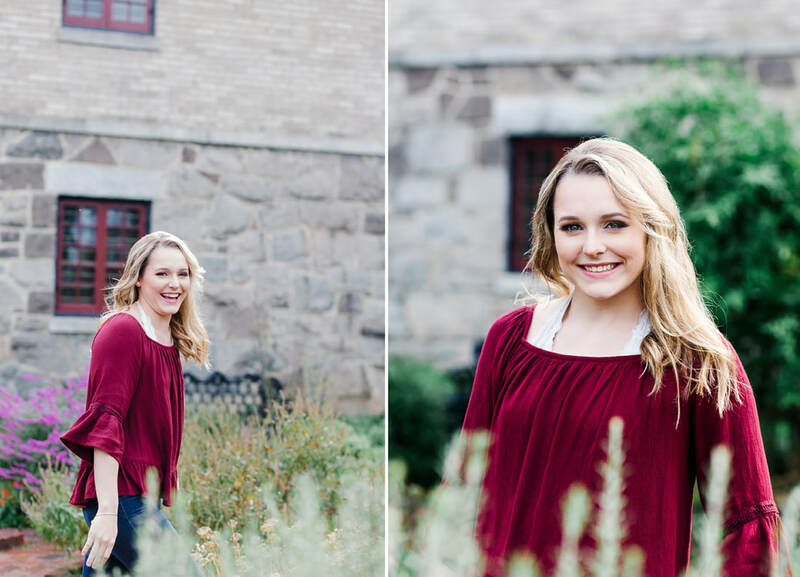 So many things to love about Megan's session at Belle Isle as we kick off senior portrait fall sessions! 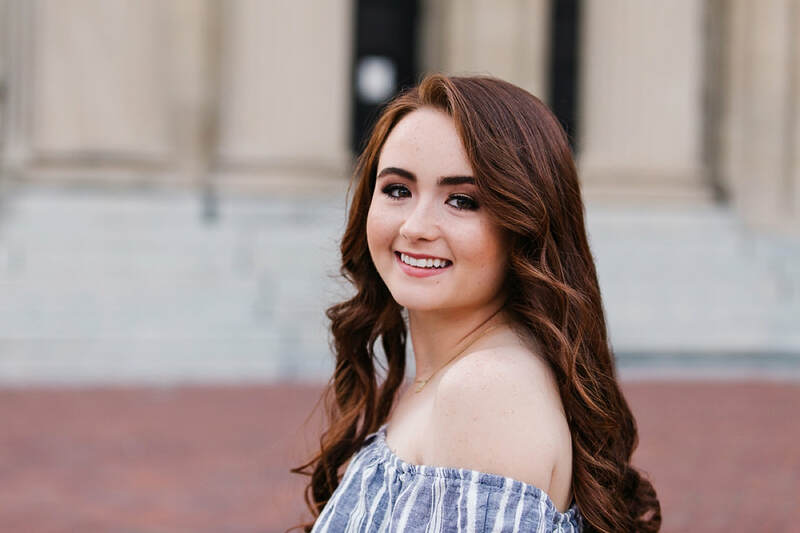 We started out with hair at Waves Hair Studio in Ashland, VA. Stacey did a beautiful set of soft curls on Megan (as seen on Instagram) and then Cameron started on her perfect makeup! 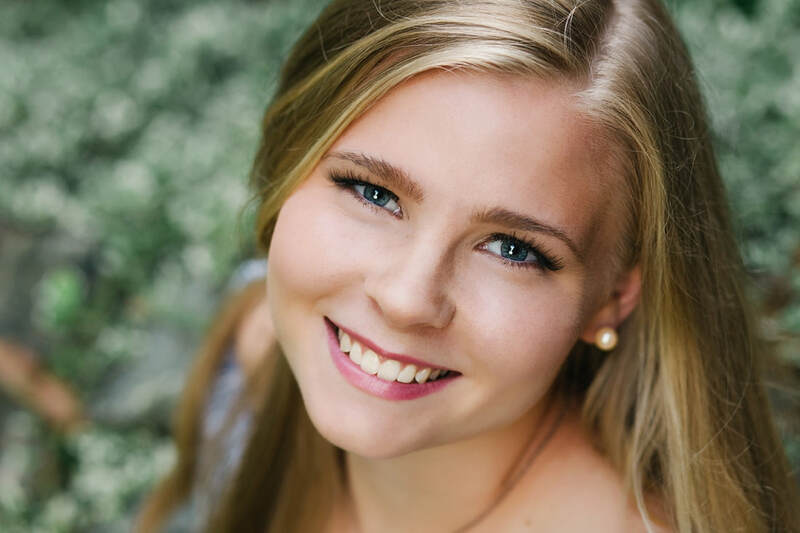 Megan is a girl who really doesn't need makeup, but it really puts a finishing touch and adds to the polished look you want for senior pictures! 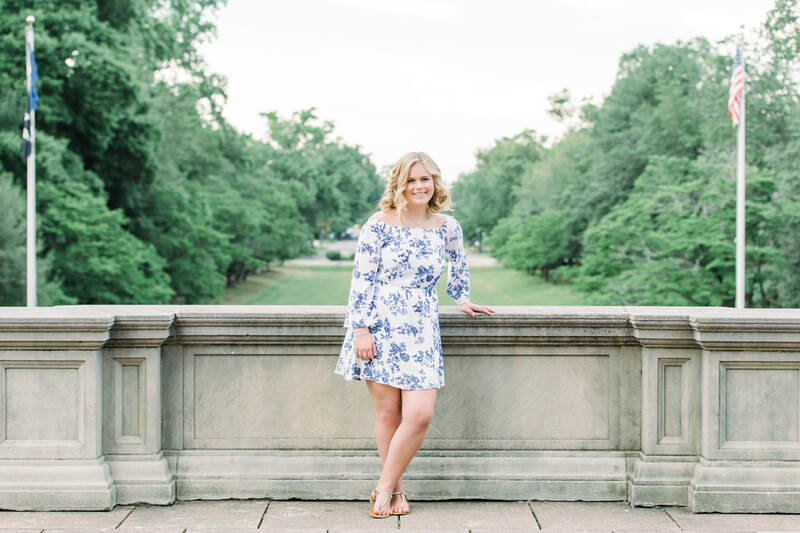 Once downtown, we trekked over the pedestrian bridge to Belle Isle and we were able to create some gorgeous images for Megan! From her blue top to her white dress, to her yellow dress and one perfect hat, every outfit was stunning on her! Take a look below and you can see what I mean. 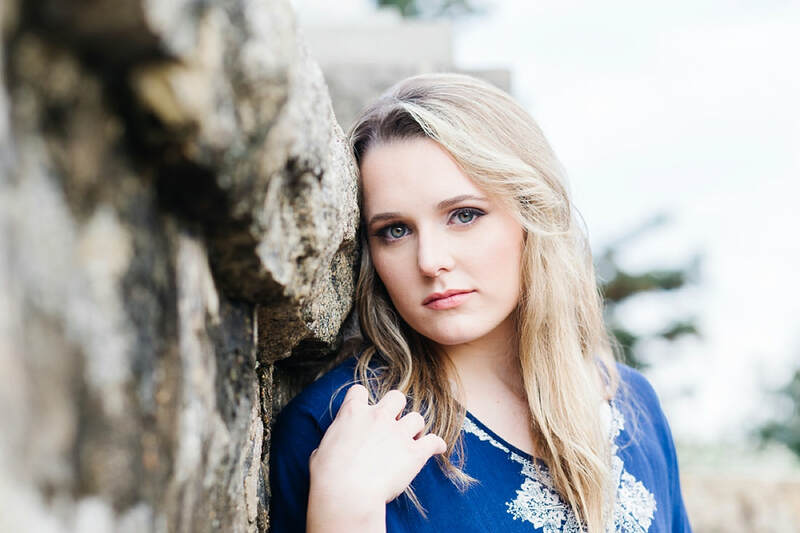 Thank you Megan for bringing such awesomeness to your senior picture session!! I just LOVE your images. 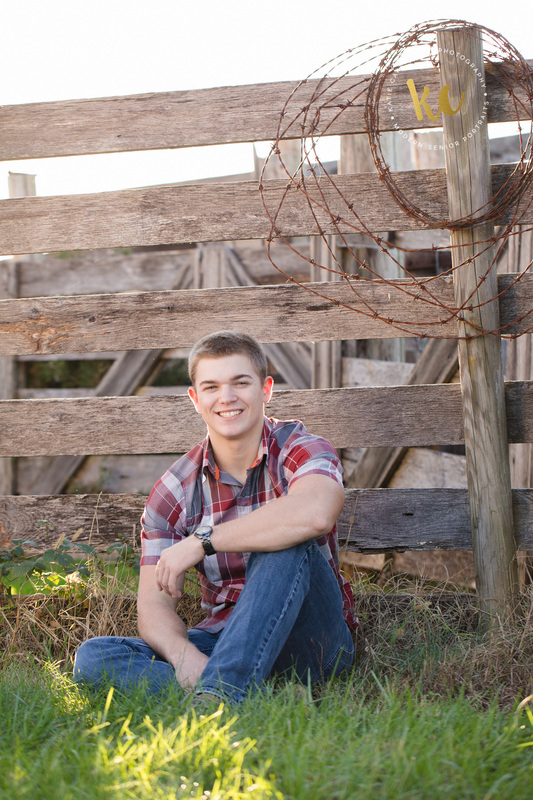 I can't wait to see where life takes you after high school, I'm thinking it will be something amazing! 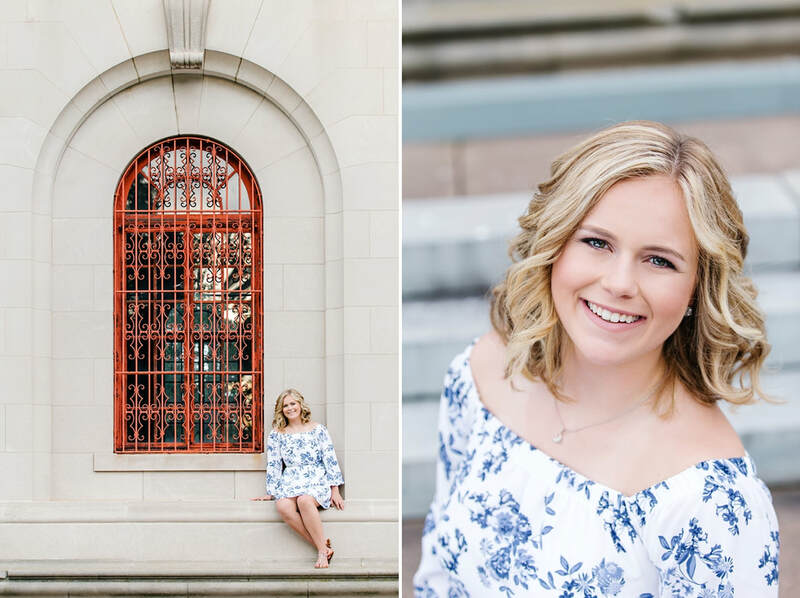 I had a great time at Allison's senior portrait session featuring locations such as Canal Walk and Shiplock Park by the river in downtown Richmond. 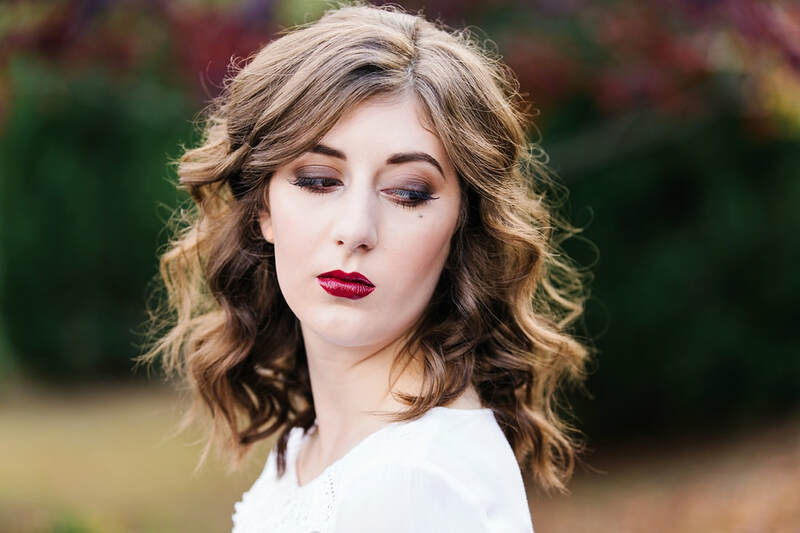 With the threat of rain later in the evening, we forged ahead with hair and makeup by the amazing Cameron Carson at my studio space in Ashland! 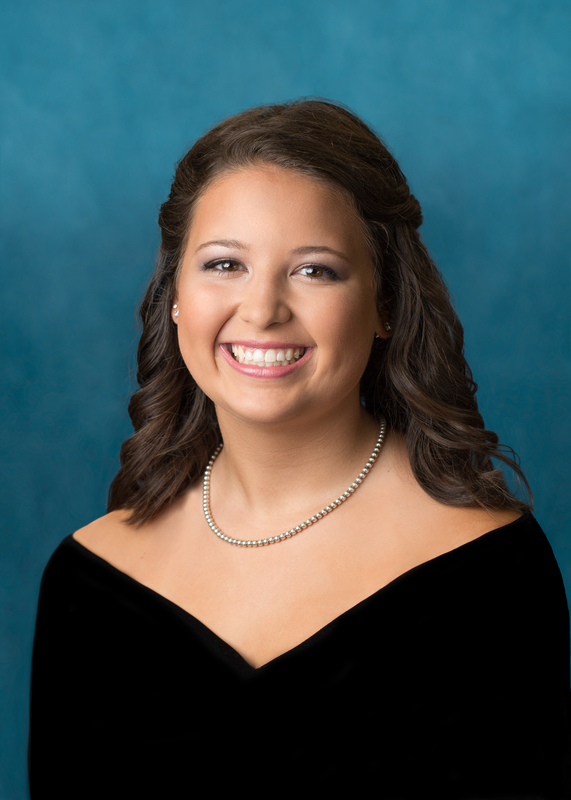 With fresh hair and makeup, we did a set of drape photos for the yearbook and then we were on our way to beat the rain! First stop was the mural area of the Canal Walk! 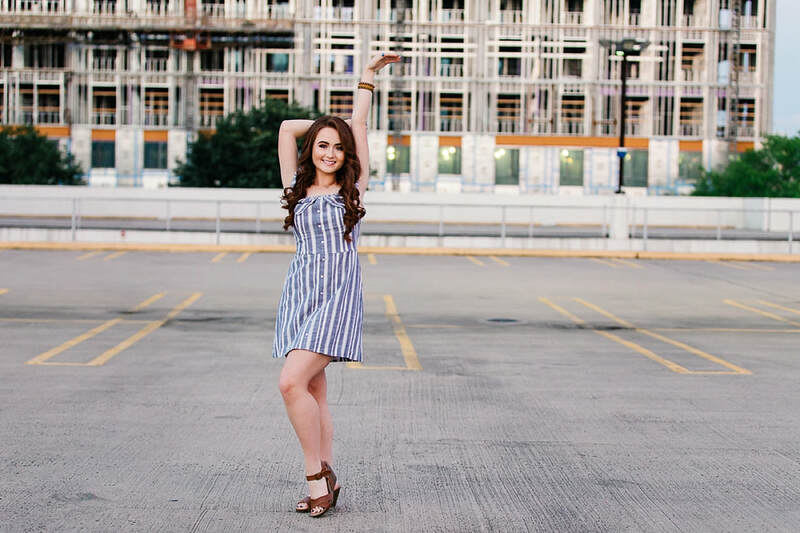 You'll see from Allison's photos, we captured so many different angles and backgrounds here - and that's why it's always so popular! 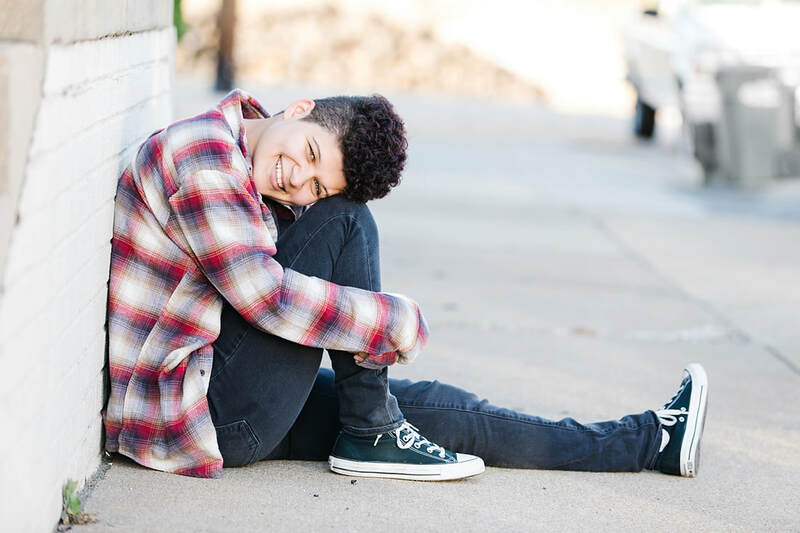 Allison is such a natural beauty with one of the prettiest smiles I've seen. Every time I took a peek at the back of my camera, I was thrilled to see how the camera LOVED her! Our next stop was Shiplock Park. At this point the skies were looking a bit more threatening, but we managed to get another great set of unique images for Allison here. 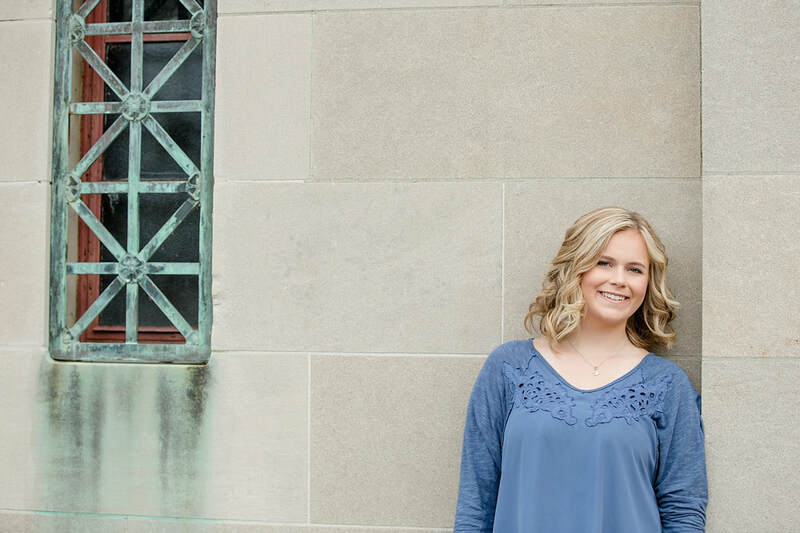 Thanks again Allison for working with me to create your beautiful senior photos! 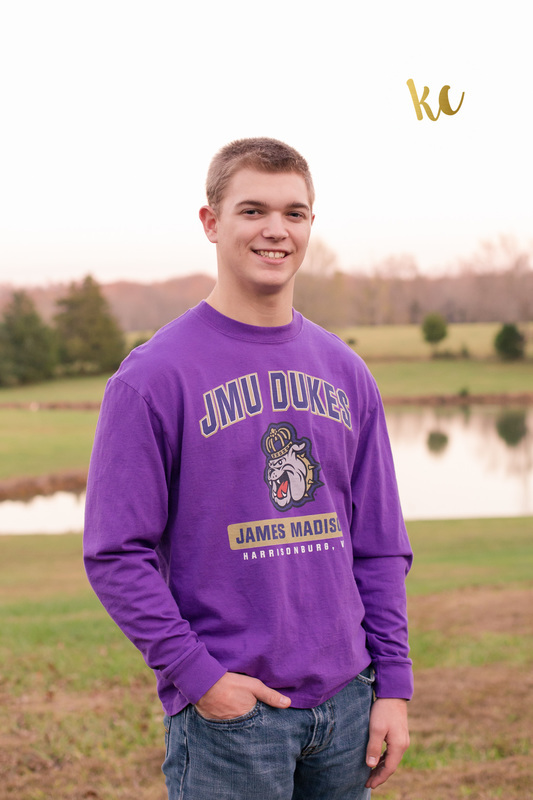 Best wishes to you as you finish your senior year at James River High School and when you head off to college in the fall! Keep me posted where you decide to go! 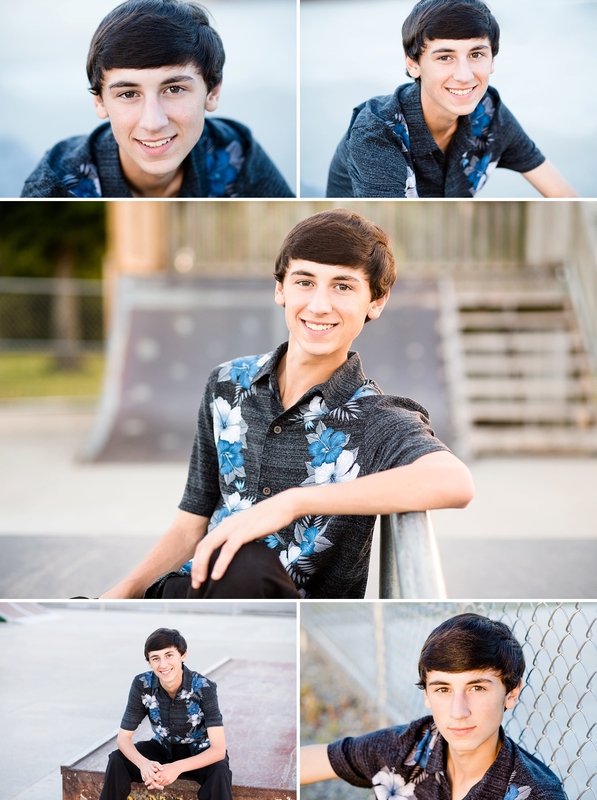 I had the privilege of photographing Tanner's senior portraits this summer. 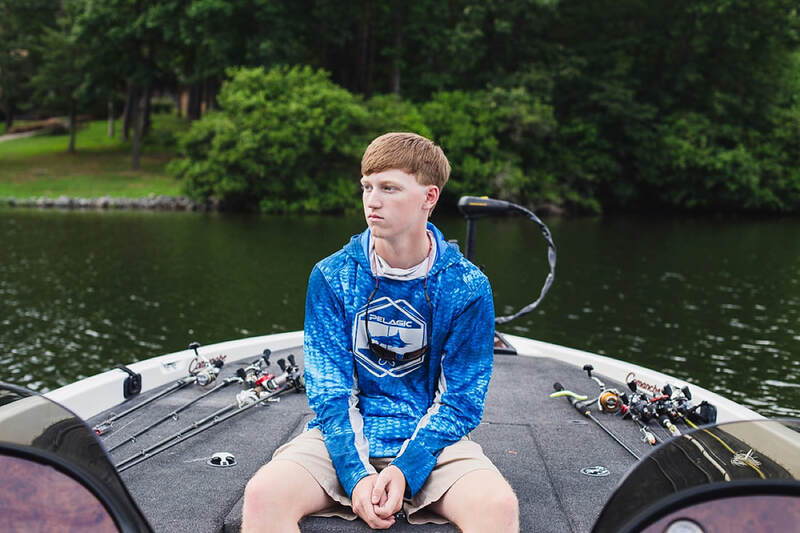 Since Tanner is an avid fisherman and competes in FLW Bass Fishing League tournaments, it was a priority to have some photos of him fishing on his boat. 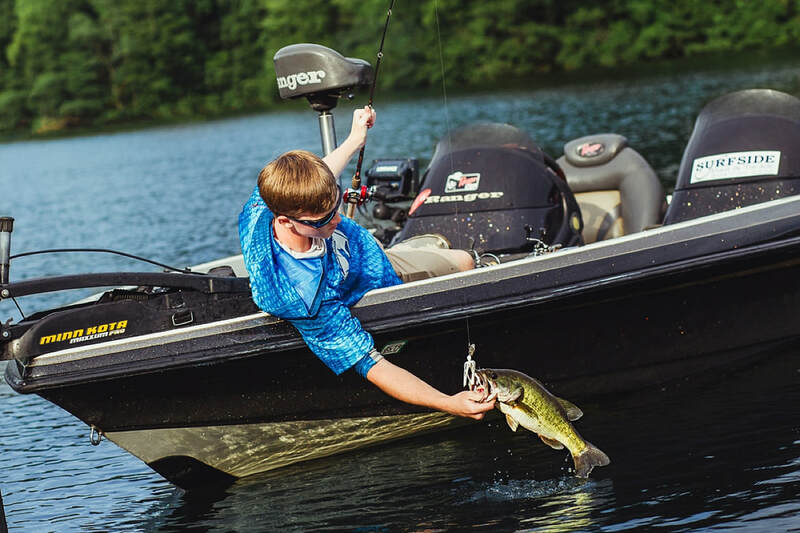 We started at Lake Anna and kicked things off with Tanner doing several catch and release sequences from his boat while I stayed on the dock. Then we got to motor around the lake a bit in his boat so I could capture some different angles. It had been a dark and dreary day up until the evening and things really started to clear up nicely for us! 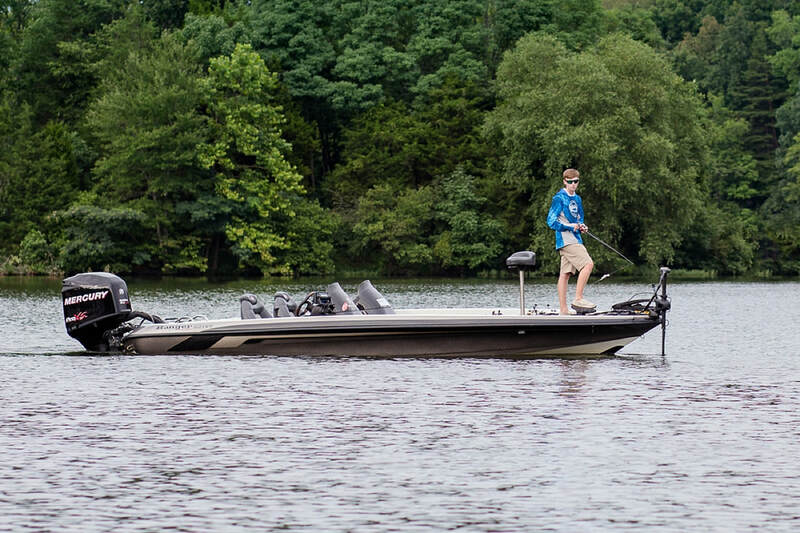 After the boating and fishing pictures were complete, we headed out to get some different shots. 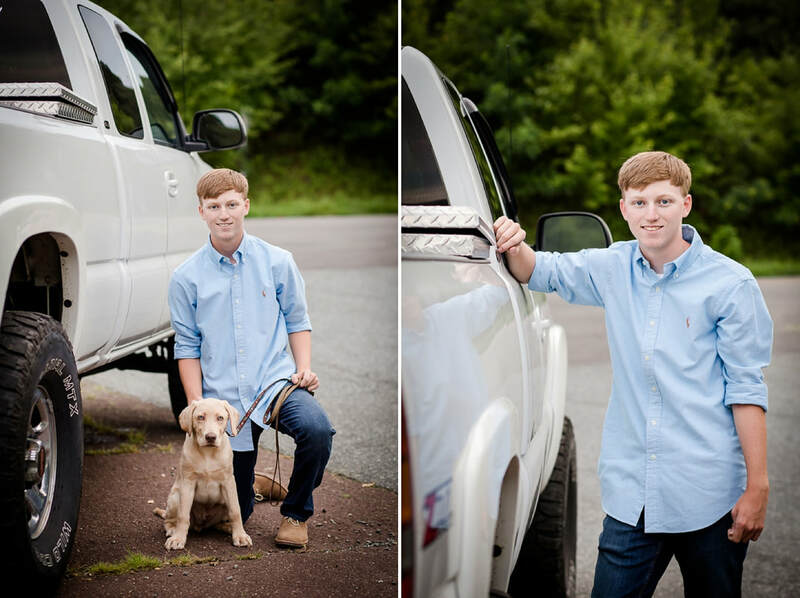 Tanner's truck and his new puppy even stole some of the spotlight for a bit. When we wrapped things up as the sun set I knew we had created some amazing photos this family will treasure! 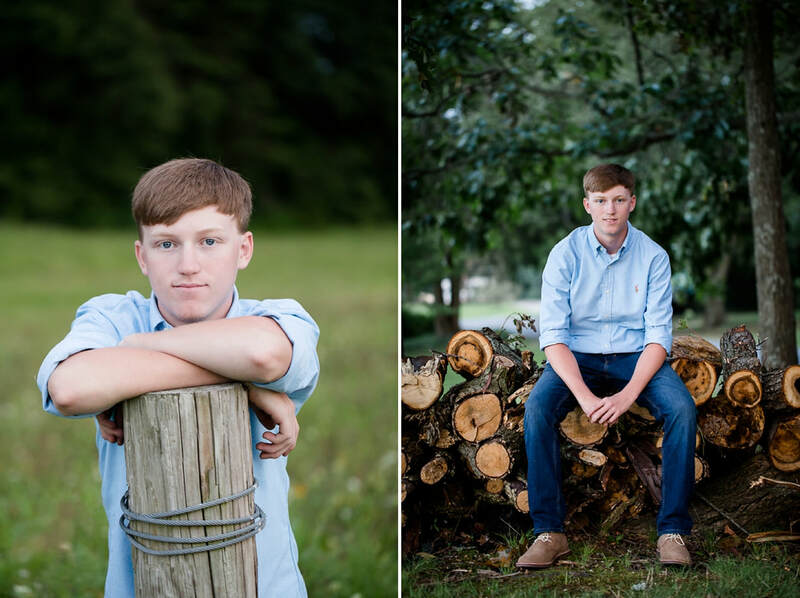 Thanks Tanner and family for working together with me to create such an amazing senior portrait experience! 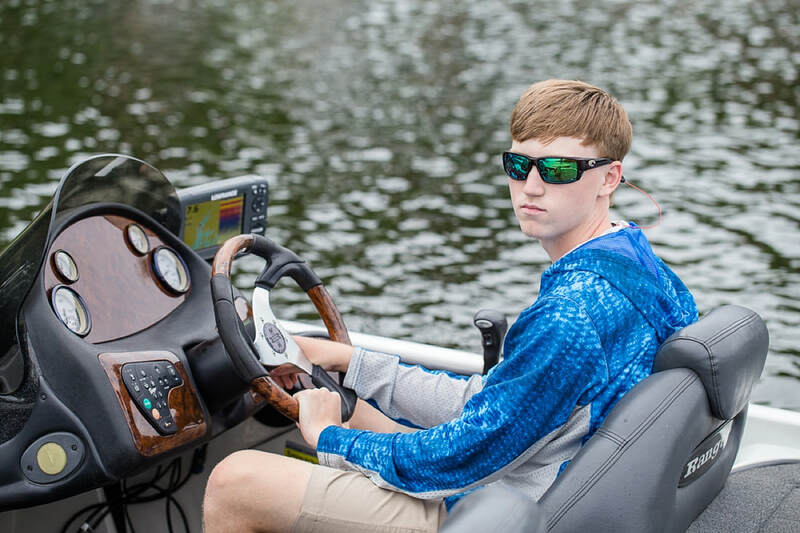 Best of luck to you, Tanner as you finish your senior year at Atlee High School and continue to compete in fishing tournaments! 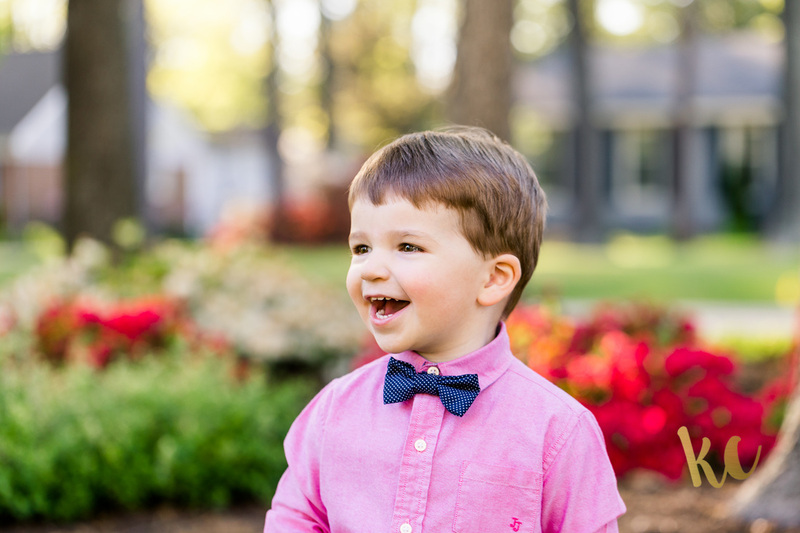 Milestone Portrait Session for this two-year-old! I love that they wanted it at Grandma's house with her azalea's in bloom. 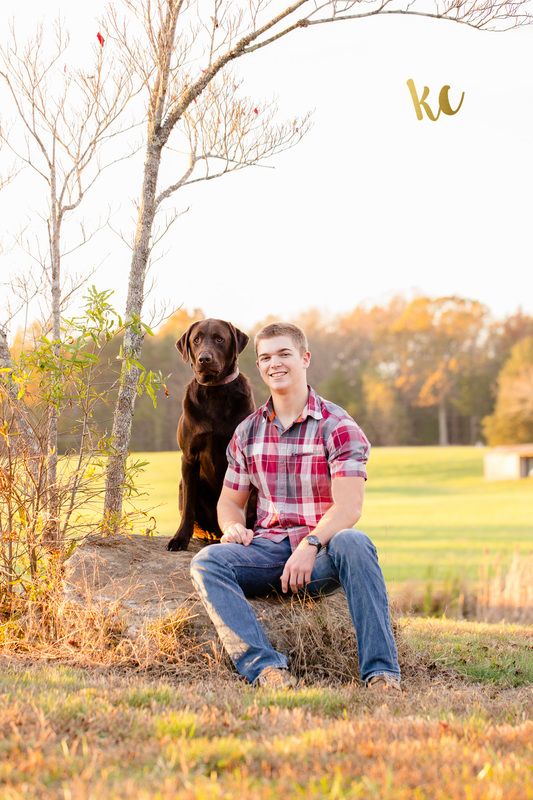 It was the perfect backdrop for a fun little photoshoot! 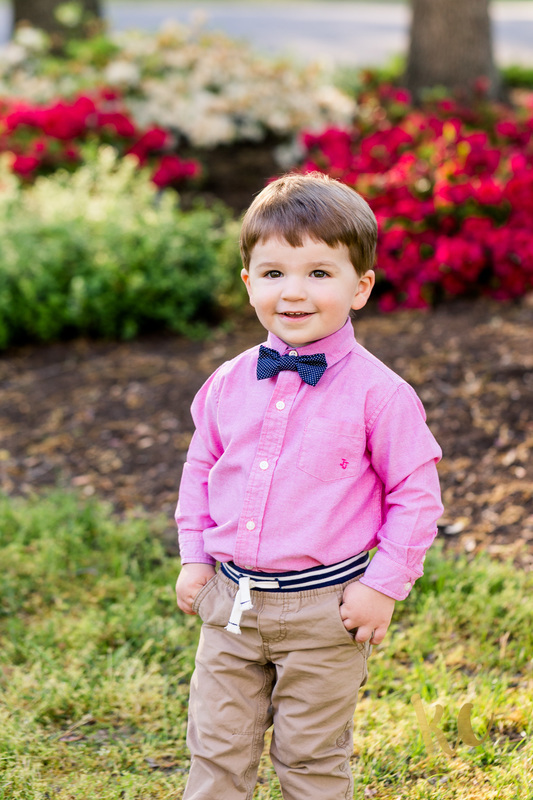 This boy has to be melting hearts with that smile! 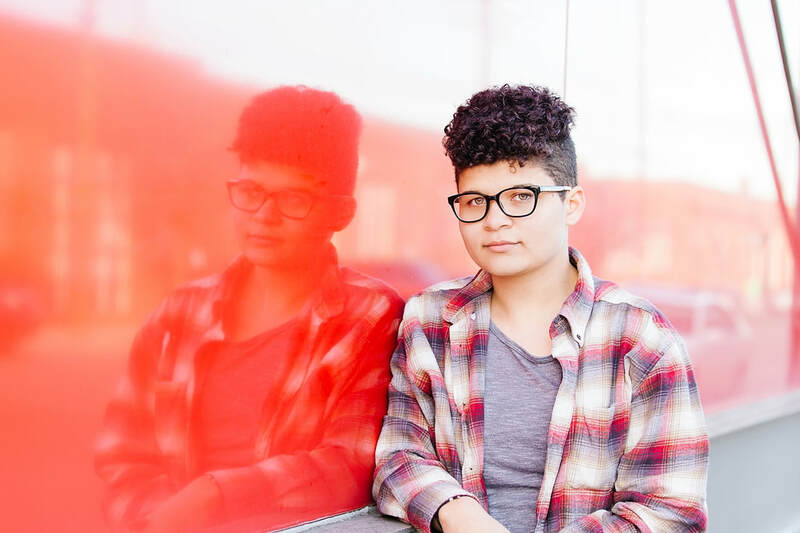 Thanks Rachel for another great session! Ah! 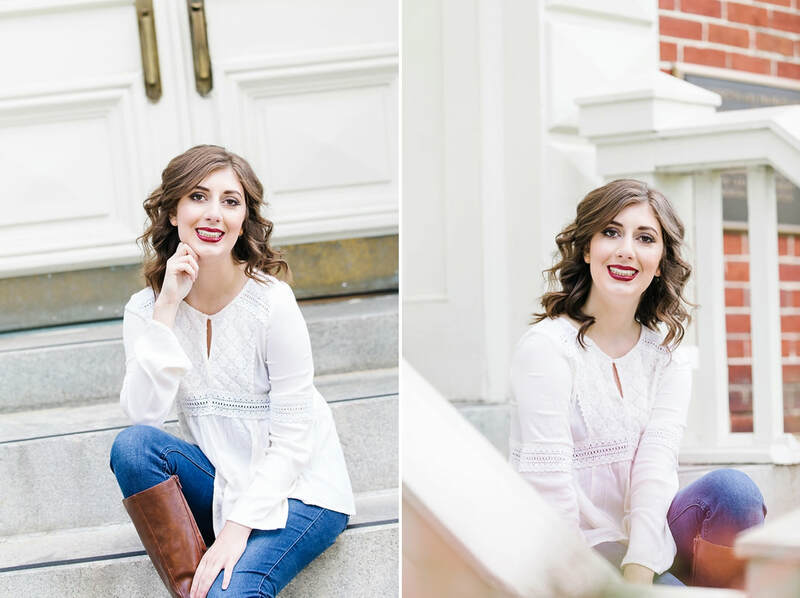 I'm so excited to share Morgan's amazing Carytown/Uptown senior session on the blog! 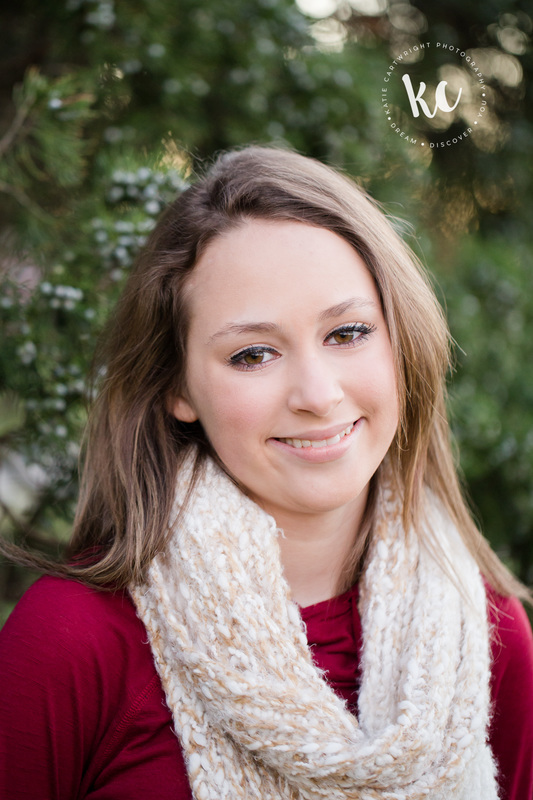 As soon as I finished our phone conversation, I knew Morgan was going to have a gorgeous session! We talked about outfits and options as well as hair and makeup ideas. It was clear that she has a great sense of style that is all her very own. Striped dress with jean jacket and Chucks, comfy sweater with jeans and riding boots, and for a third look, a dressy maroon top with jeans. Don't they all look amazing? I literally oohed and ahhed the whole time we were photographing because there was just such beauty in the colors and our light that evening was to die for! 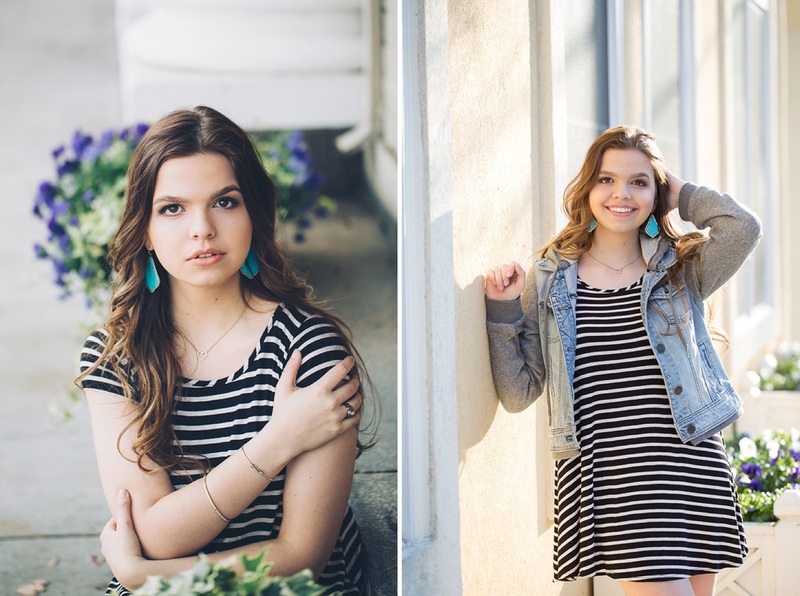 This was my last senior session of 2015 and I couldn't be happier with the result! 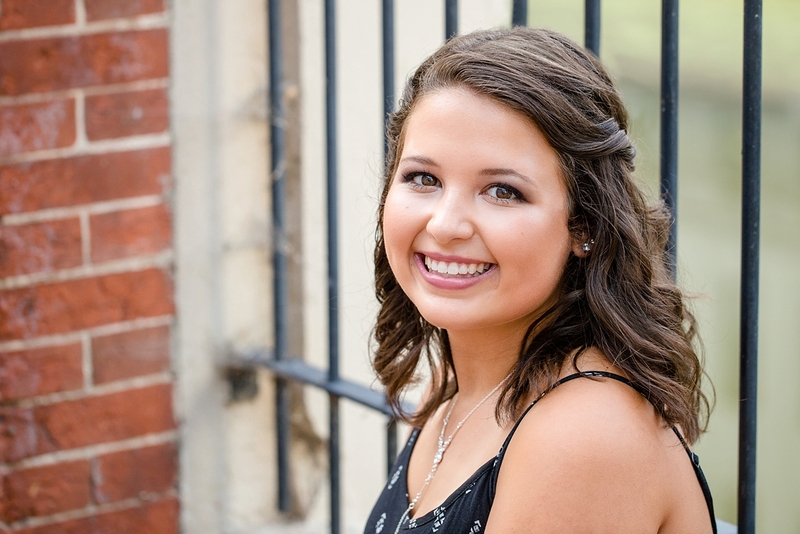 Thank you Morgan for booking your senior portrait session with Katie Cartwright Photography - it was a blast! Each winter, I anticipate our first snowfall of the season. Living in the Richmond Virginia area means that there is no guarantee we will get snow, but sometimes we get a little more than our fair share. 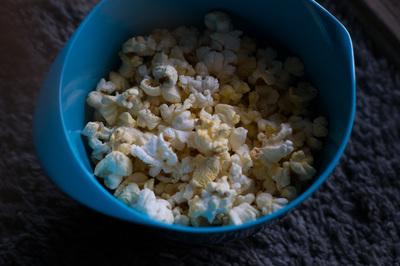 I love a good snow day when it means I can stay in my pajamas, drink hot cocoa and snuggle up with the kids for a movie (or dare I say a nap). We venture out for a bit here and there to play in the white stuff. Make a snowman. Make snow cream. Make memories. I have several blog posts about snow photos, but today I'm going to share some of my tips with you! You can view the original blog posts by clicking on the photos below. If you plan to take photos of your snow day shenanigans, there are a few things you can keep in mind to help you create your best images. #1. Snow reflects light. It creates soft beautiful light as it bounces light everywhere. It makes people look like they glow a bit and adds a sparkle to their eyes. While this is generally a positive element, it can also create a lot of glare, as anyone who has been skiing can affirm. Tip: Position yourself with the sun behind your subject. On most days, this will result in underexposed people/subjects since they are now in shadow. With snow on the ground, light is reflected back up on your subject(s), reducing the shadow! Bonus tip: Snow reflects light inside, too! 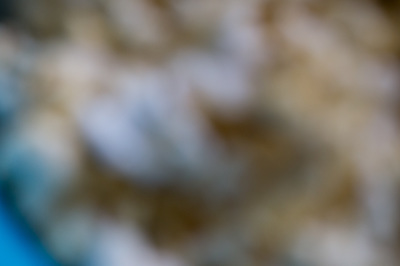 With all that snow on the ground, your indoor photos will be brighter as well. Take a picture of someone looking out the window at the snow and you'll be amazed at the results. Just make sure they don't have any direct light from the sun on them. #2. Snow is white. Your camera is programmed to expose for middle gray (unless you tell it otherwise), meaning it's going to take those bright and white photographs and darken them down some until it averages gray. If you're using the auto setting there isn't much you can do about this. Tip: If you use Aperture or Shutter Priority or even Program mode, you will be able to adjust shift your exposure to a brighter setting. Some cameras will even have a Snow scene option which will pump up the exposure a bit since your scene is mostly white and not gray. Of course, if you are in manual mode, you can adjust all of your settings to properly expose your image. I also like to venture out on my own to capture snowflake photos when the snow is just right. I don't go far, usually just my front porch. I'm often in my pajamas with my coat and gloves, armed with a camera and a light if it's dark. (LED lanterns work great if you're doing this at night.) The following should help you get started if you want to give it a try too. #1. You'll need to get close. Snowflakes are tiny and you'll need to get as close as possible to them. 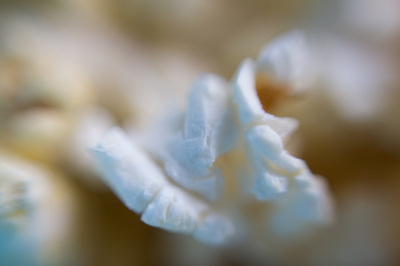 Macro lenses allow the camera/lens to focus on things at close range. The Canon 100mm macro lens will focus on something as close as 11 inches. In comparison, the typical 18-55mm kit lens that came with your camera needs a minimum of about 1.5 feet to focus and the 55-250mm lens that you might also have, needs about 3.5 feet to focus. By allowing the camera to be that close and focused is part of the macro magic! First, start by setting your camera's aperture to f/4 or f/5. 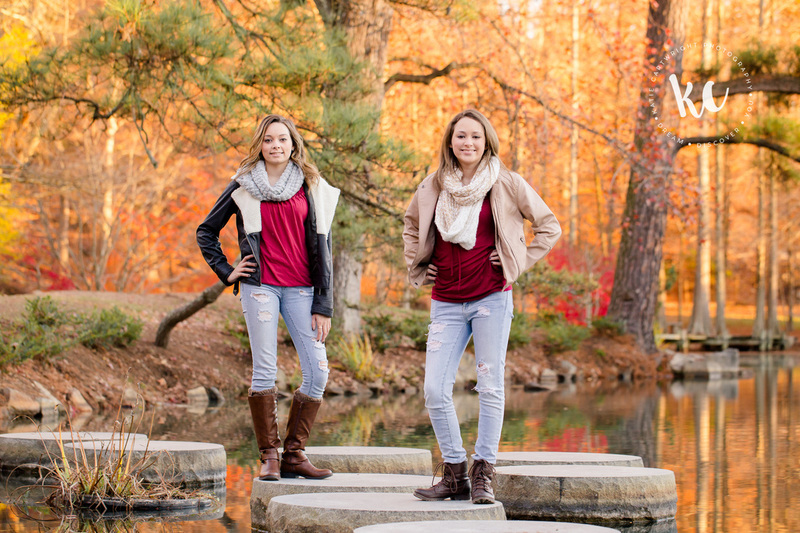 You'll need to be in aperture priority or manual mode to do this. (If you're not familiar with these modes, I'd love to tell you about them! Check out the class interest form below). 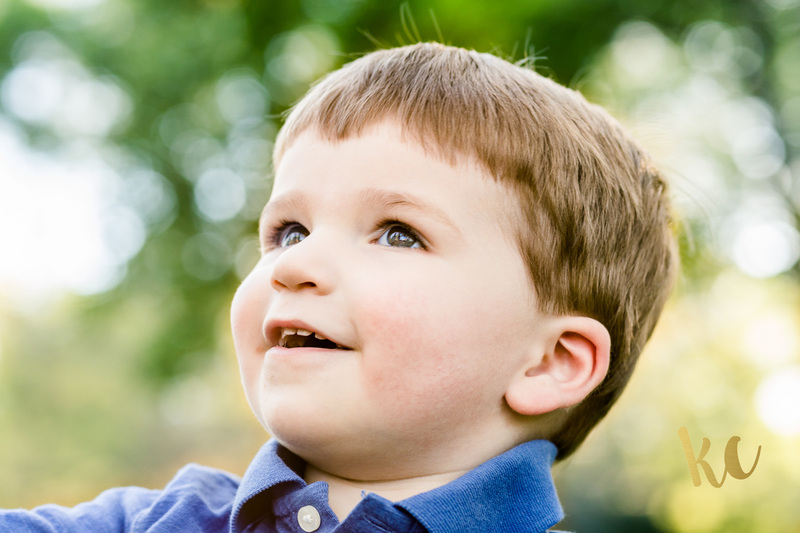 Next, take a lens with a small focal length such as 50mm and hold it firmly up to your camera's lens ring. They make connectors for this very purpose - attaching your lens to your camera backwards. I don't have one, so I just carefully hold it in place with my left hand. Finally, with your camera up to your eye, move in close to your subject until things appear in focus and take a picture. Your auto-focus will not work here, so you have to move around until your subject is in focus. 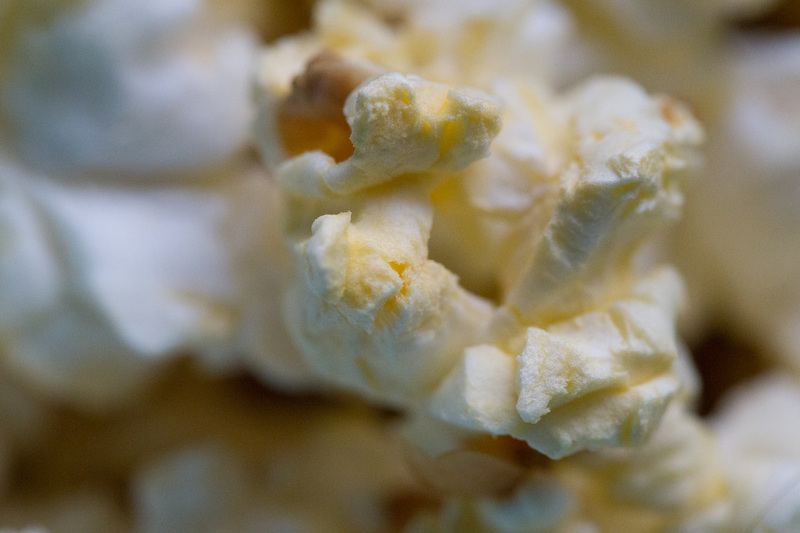 Hover over the popcorn images below to get an idea of how each one was created. Key tips here are that the shorter focal lengths will zoom you in further (it's backwards). If you can't get things in focus, you're probably not close enough. Move in closer. If you can't take a picture, you may have your camera set to not click the shutter unless you have achieved focus. Check out your settings to change that. Feel free to ask questions in the comments if you're having trouble. #2. Not all snow storms create pretty flakes. Sometimes the snow is just clumps of fluff falling from the sky. This is a great time to get a little practice in, but isn't as awe inspiring as a perfectly sharp photo of a tiny little snowflake. Tip: Place a blanket, mitten, or scarf on your porch, steps, or a railing to catch the flakes and allow you to examine their form. Leave this item outside so it stays cold and it will help keep the flakes from melting on impact. It also creates a lovely backdrop for your photos. Fair warning: it takes patience and time to wait for perfect flakes and to get things in focus, so dress to be out in for a while. It will be a little addicting and you might stay out longer than your body likes. Here's a bonus tip: Have some hot cocoa made up in advance and place it in your microwave all set so you just have to hit start. I hope you enjoyed these facts and tips to help you with your photo making adventures. I'd love to see your photos. You can share them on my facebook page or in a private message. 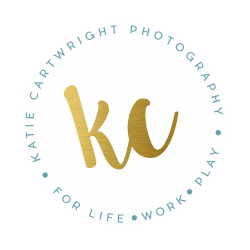 I'll only repost photos with your permission and with photo credit to you, of course.If you're interested in taking a photo workshop to learn more about how to use your camera, fill out the short form below and I'll be in touch soon! Do you want to learn more about how to use your camera to create better photos? 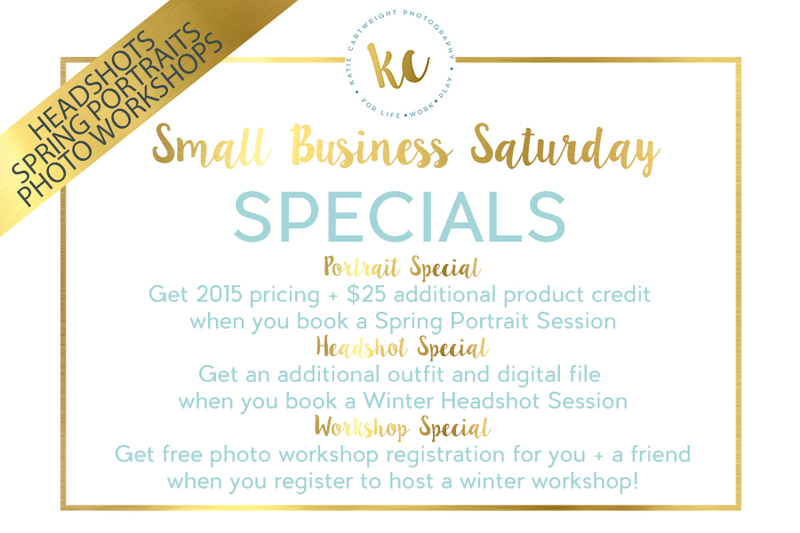 Sign up to take Creating Better Photos - DSLR Workshop or the Mini-Workshop! Enjoy these once a year specials for Small Business Saturday! Check out the details below and contact me by midnight (11/28) to take advantage of the special deal! 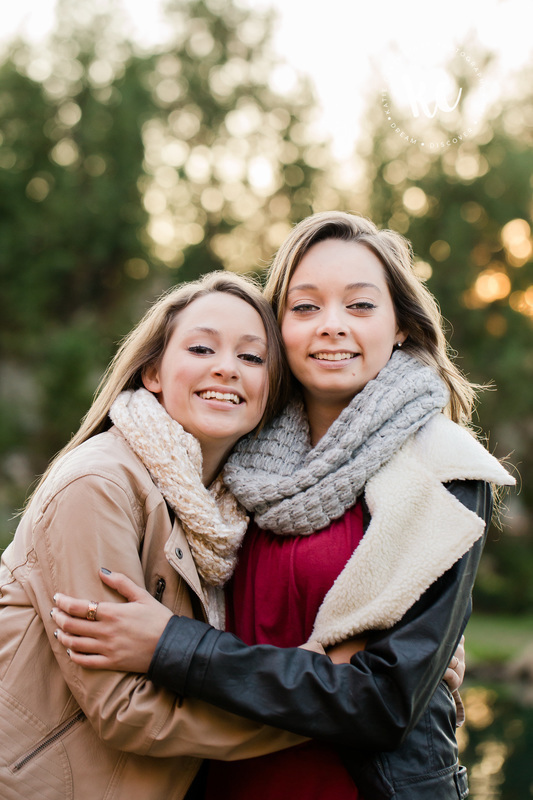 Portrait Sessions booked for spring (March, April, May) will get 2015 pricing plus $25 additional product credit! 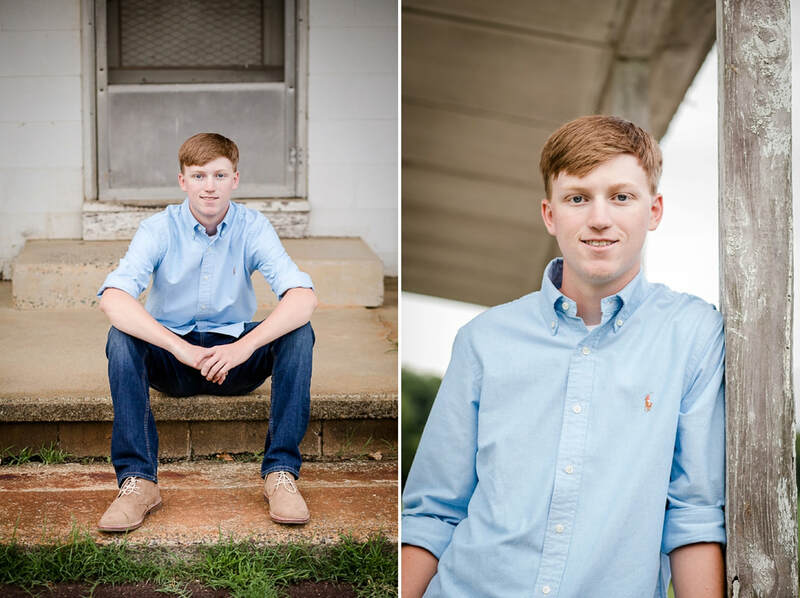 Check out portrait session information here and be sure to indicate which session type you would like to book (senior or family and which session level for seniors). Booking forms and deposits must be received no later than Sunday (11/29) at midnight for this special. 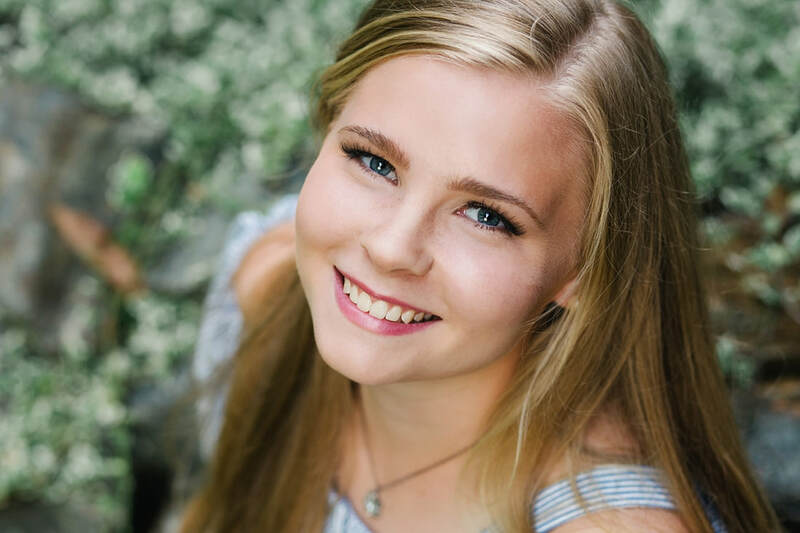 Headshot Sessions booked for winter (December (limited availability), January, February) will receive an additional outfit plus an additional digital file! 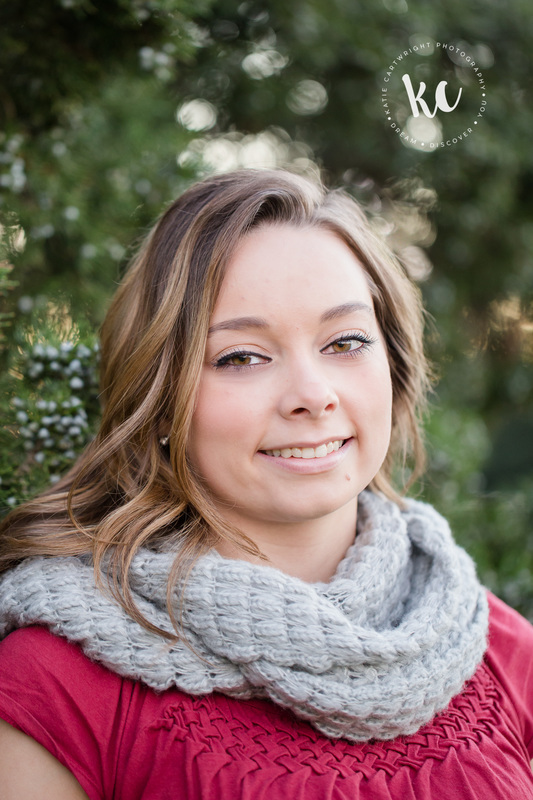 Take advantage of the updated hairdo and new clothes and get an updated professional headshot! 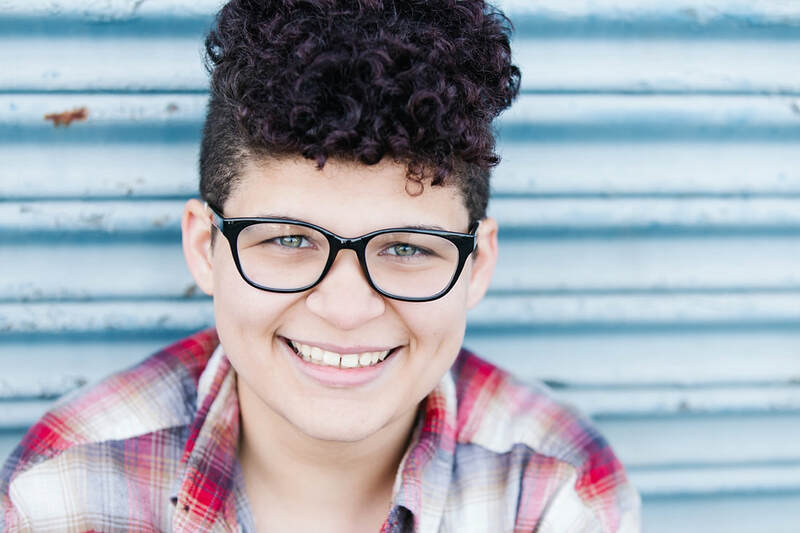 Check out headshot session information here before booking. 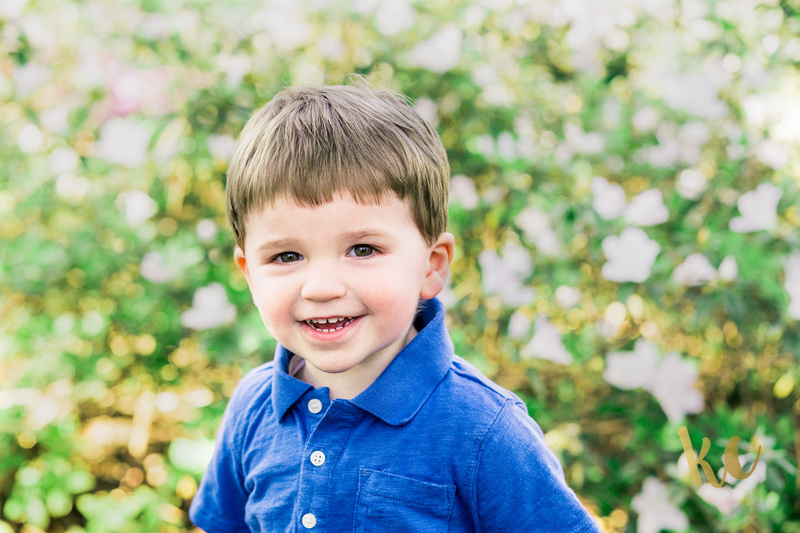 My in-home photo workshops have been a hit! The workshop host takes care of location, food, and drinks so I can focus on what I do best, teaching and photography! Workshop hosts get free registration when they have 5 paying participants. Sign-up to host a winter workshop (January, February, March) and get a friend in for free, too! Workshops still must meet the minimum of 5 paying participants. Check out the in-home workshop details here for more information. Wow, Theresa! 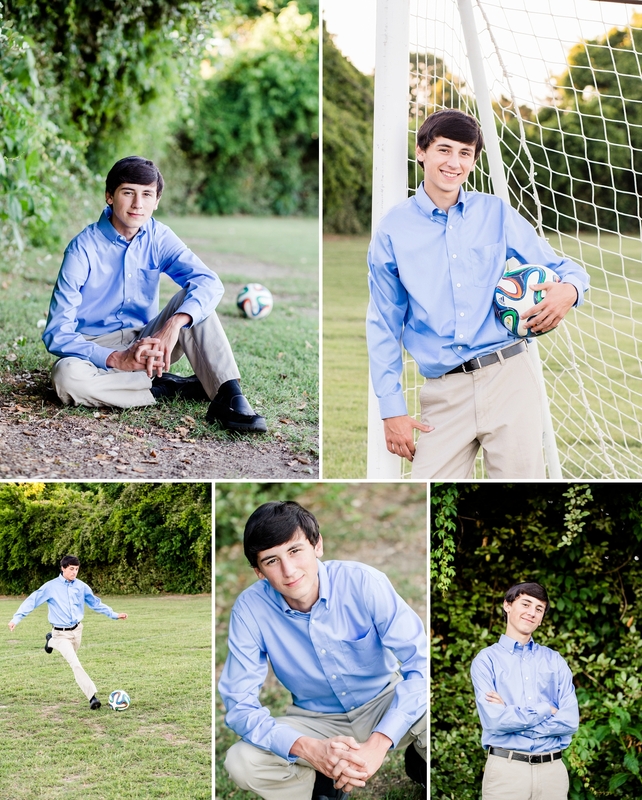 I love these senior portraits! 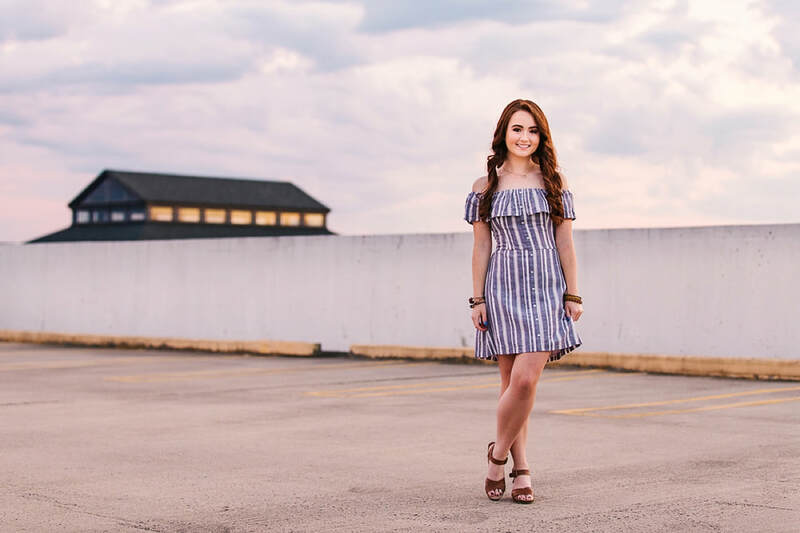 From the bright colors of your Vineyard Vines shirt to the classic look of your Lilly Pulitzer dress, you showed such different looks and wore them both well. I love that we found such great places in Carytown to really show off your style, too. It was such a fun evening and I wish you the best for the rest of your senior year.